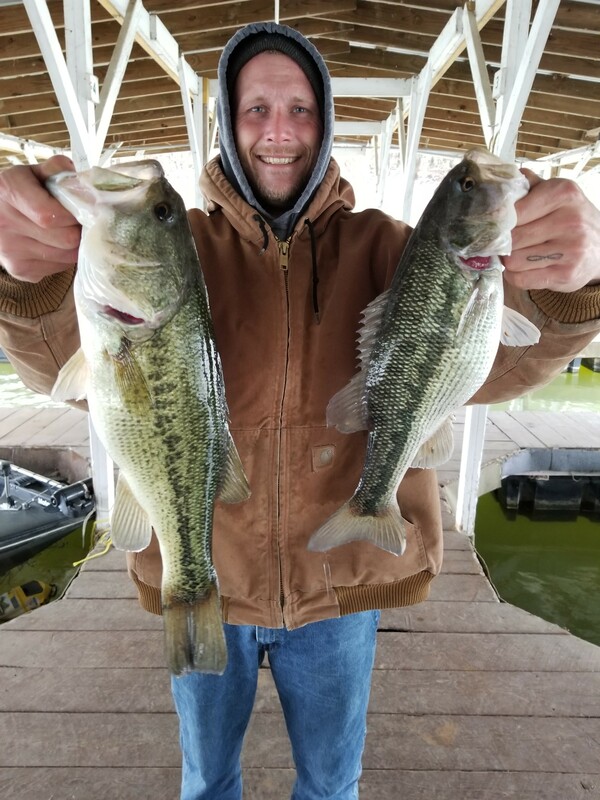 The lake level is stable at 554.50 and in general is in excellent condition for fishing with a good color and a surface temperature of 56+ degrees. 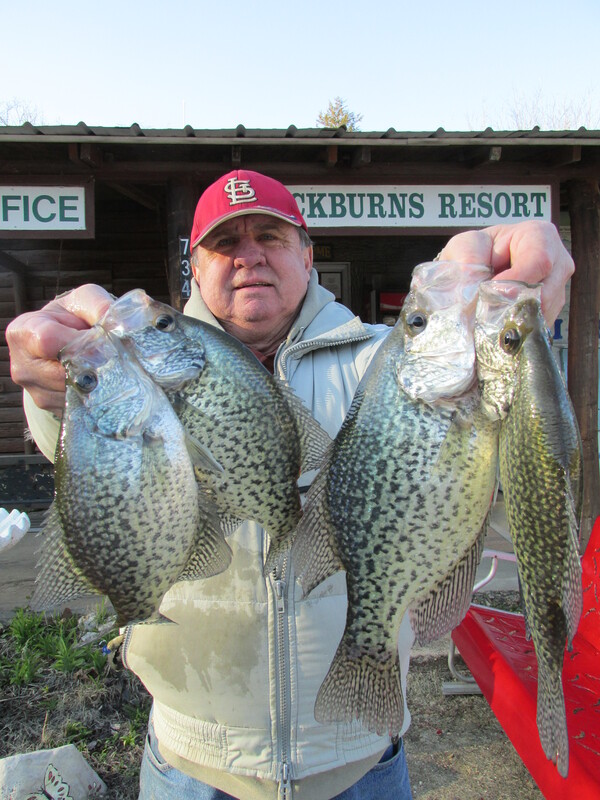 Spring is here at Blackburns with flowers and trees blooming, the grass growing and the fish biting. 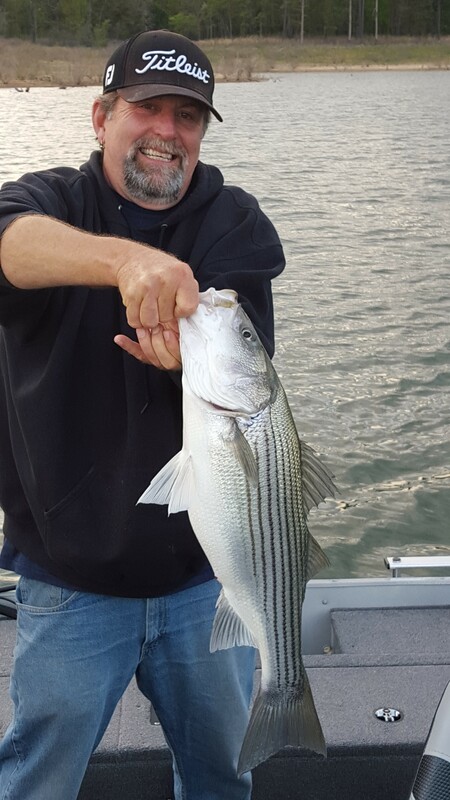 The Two best bites now are the night bite for stripers, bass on grubs, small worms and grubs. 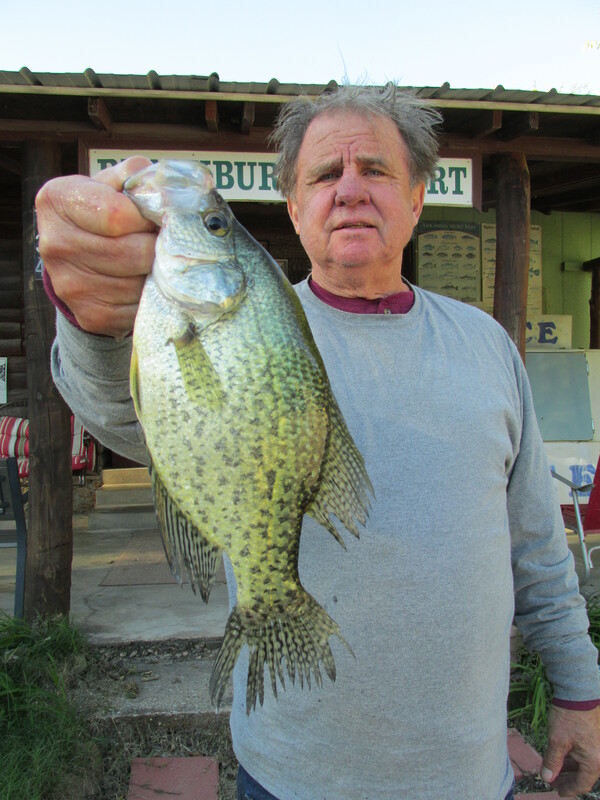 Crappie fishing is slow with a few males starting to move into the creeks shallow. 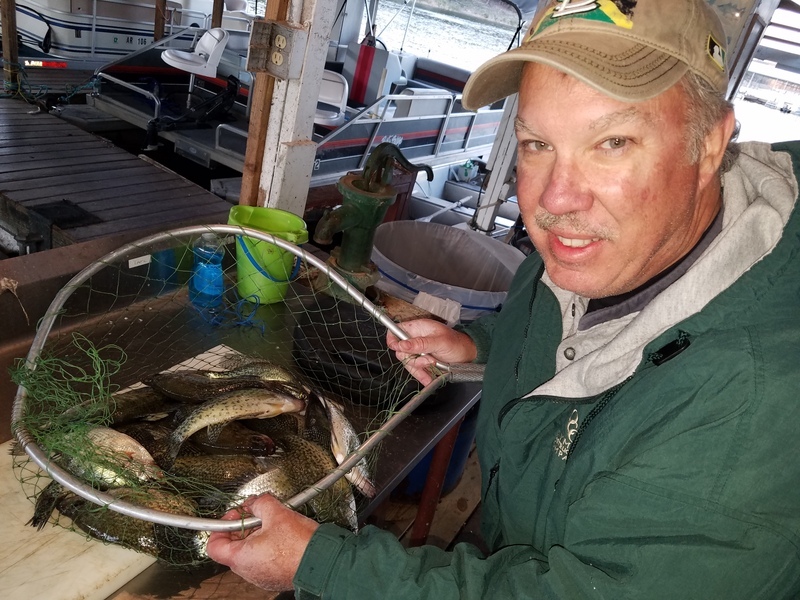 The walleye bite is also slow with just a few being caught in open water on shad with the temperate bass. Cold fronts are coming through every week slowing the fishing and then it picks up again as the high pressure hangs around for a while. When the night time lows stay in the high 50's and 60's and the surface temperature hits 60 degrees things will really break loose. Smallmouth bass have just started showing up and that is a good sign. There are a lot of fish in this lake and it is being managed very well. 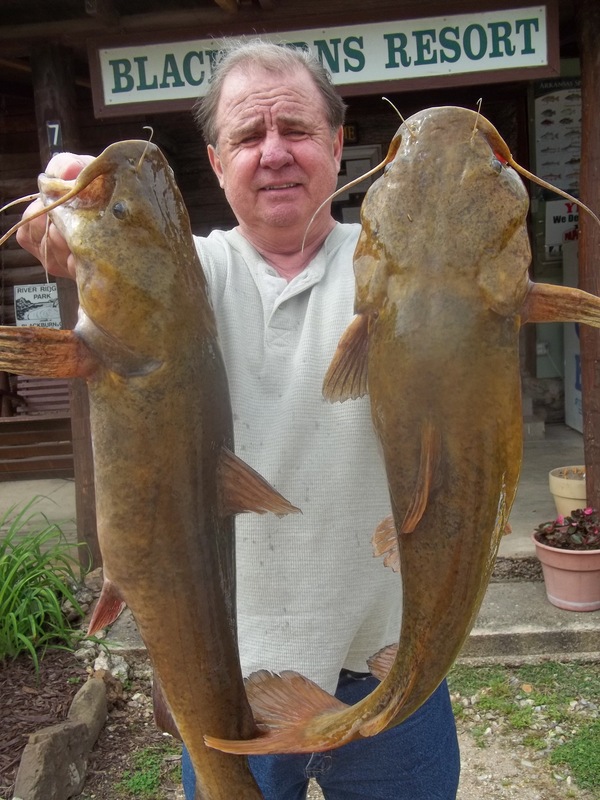 I am going to put in a trot line for catfish today. It is time. 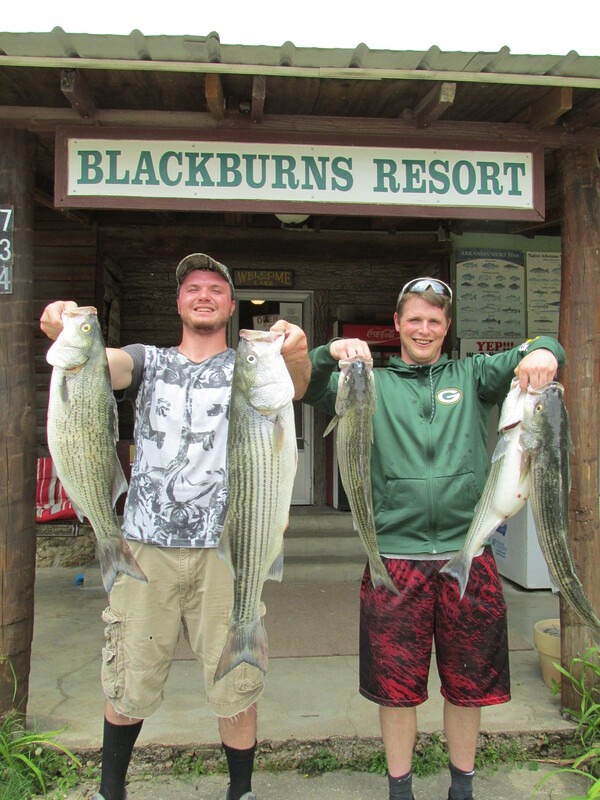 Blackburns resort and Boat Rental has the best price on both cabins and boat rentals and have made many improvements everywhere. You will like it when you get here and we continue to not charge you for your 1st boat stall. The lake level is 552.67 and rising very slowly with no generation. They need to start dropping the lake for the winter. Surface temperature is 57 degrees and the lake is pretty clear and you can see your lure down about seven feet on the main lake. The creeks vary from clear to stained almost daily. 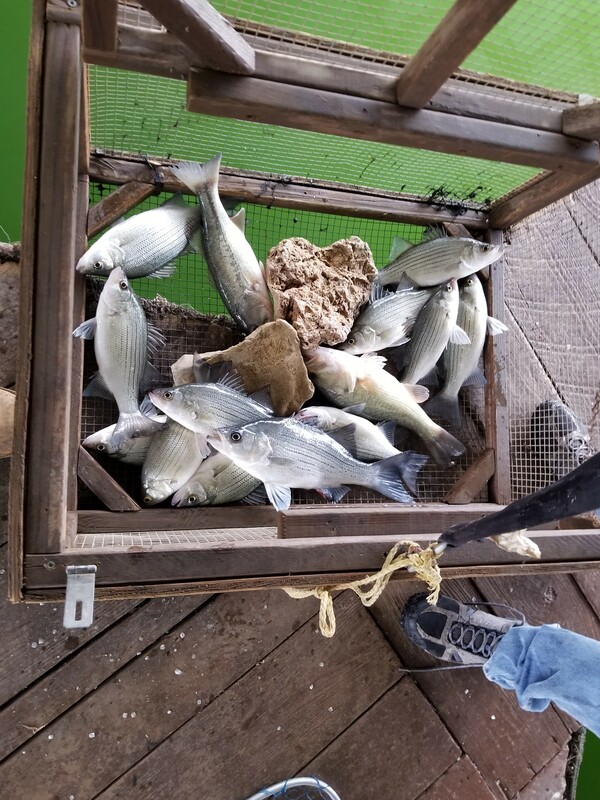 Open water fishing has been good the last few days with white bass, hybrids and bass moving into the creeks in about 35-feet of water early. It has been foggy most days with the water being warmer than the air except when the cold fronts move through and that is weekly. 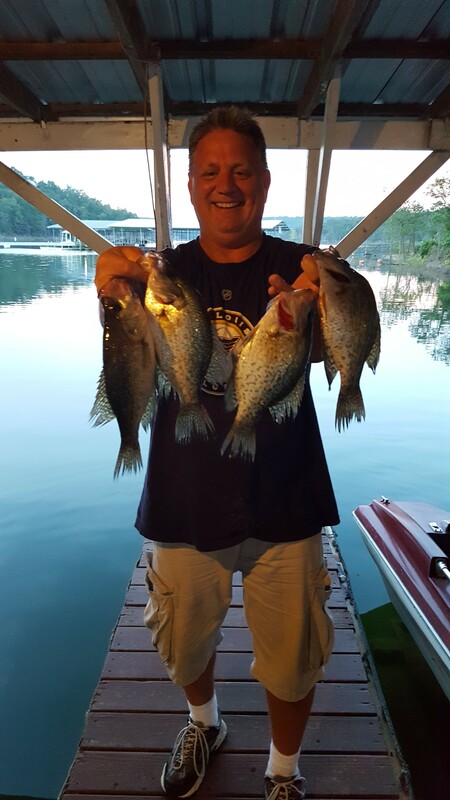 Crappie, bass, catfish and bluegill are on 25-ft. brush and are coming up to about 10-feet to get the bait. Some very nice fish are being caught everyday. 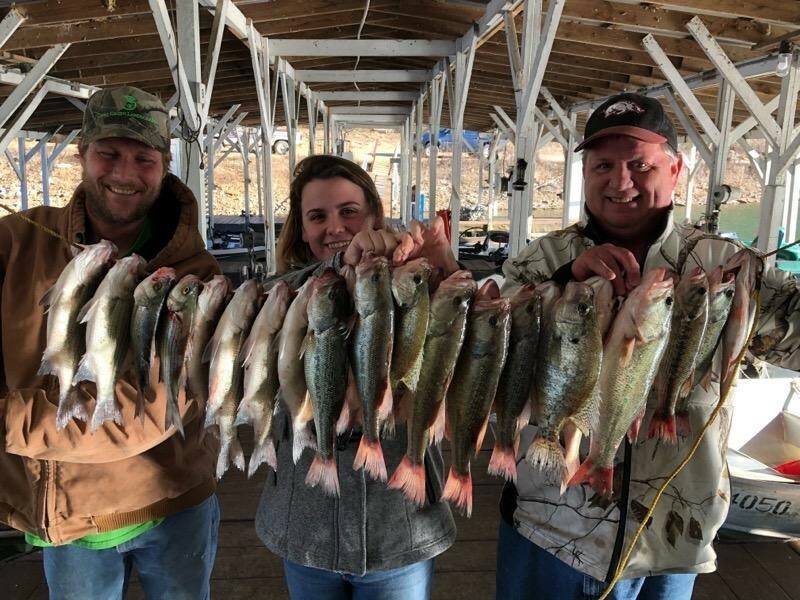 Blackburns has been very busy this fall with people taking advantage of the best prices on both boats and cabins and getting their first boat stall free. Trolling motors are also free on fishing pontoons. All cabins have covered porches and none are duplexes. 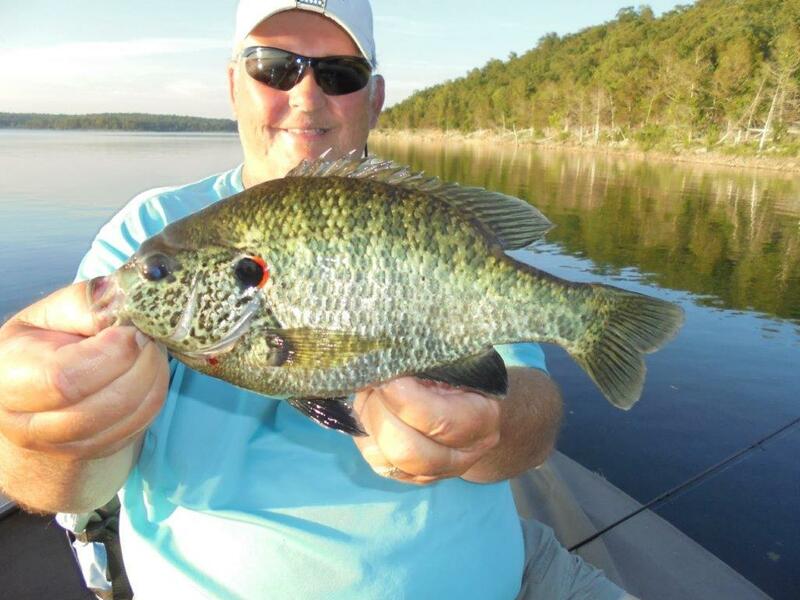 Spoons, minnows and grubs are the best for crappie with spoons, drop-shot and finesses worms for bass. Spoons are also best for open water fish. 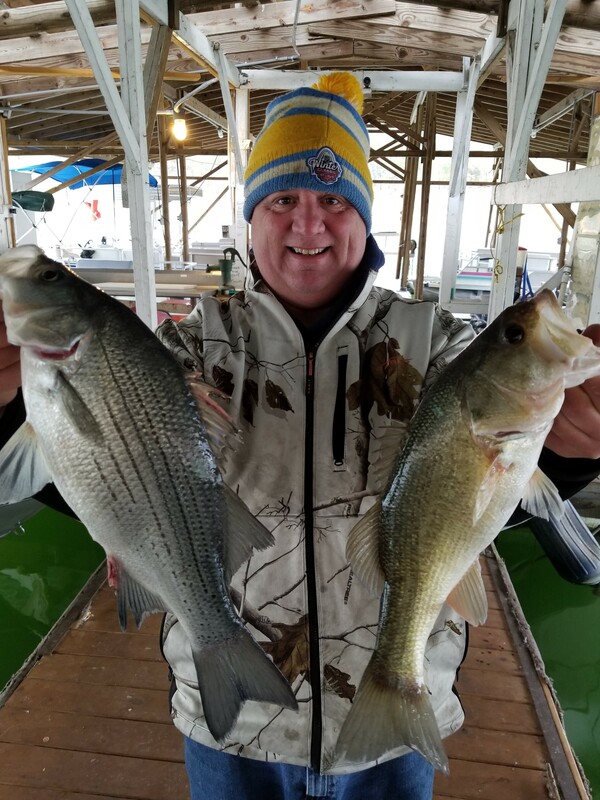 A lot of white bass, bass and a few hybrids are hanging out together with an occassional striper and walleye on shad in 35-40 ft. of water suspended. 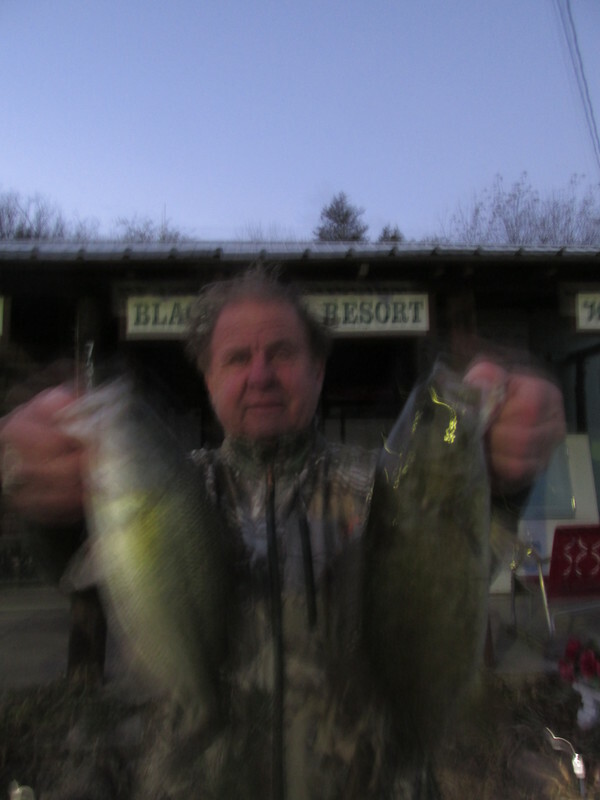 Some bass are on the bank in the evening on steep river channel banks. 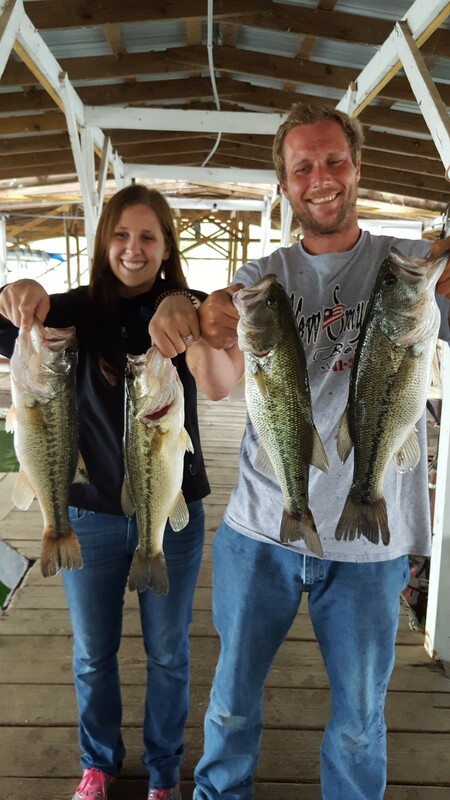 Fishing overall is pretty good with the lake in excellent condition. The lake level is 551.17 and rising very slowly with no generation. It is raining now.The surface temperature is about 72 degrees on the main lake and cooler in the shallower creeks. You can see your lure down about 6-7 feet on the main lake. 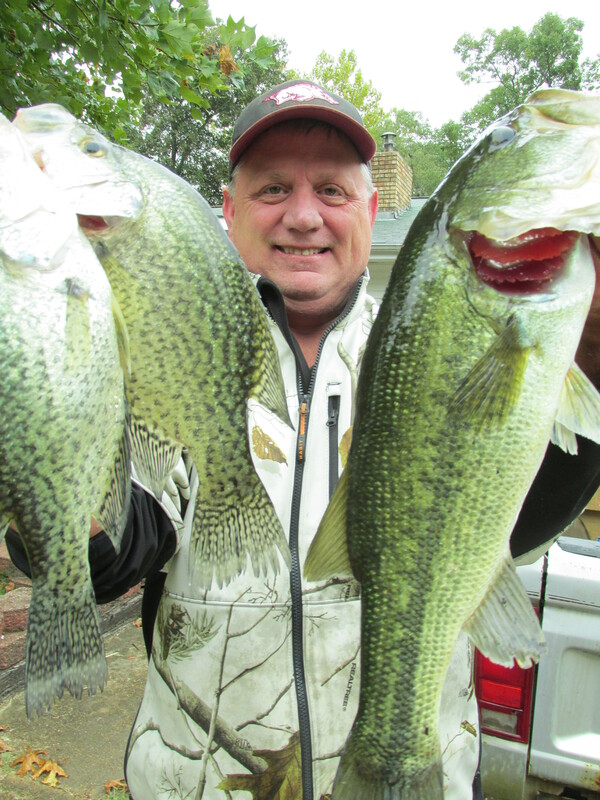 The new news is that the lake is starting to turn over and the crappie and bass are moving to the brush piles. 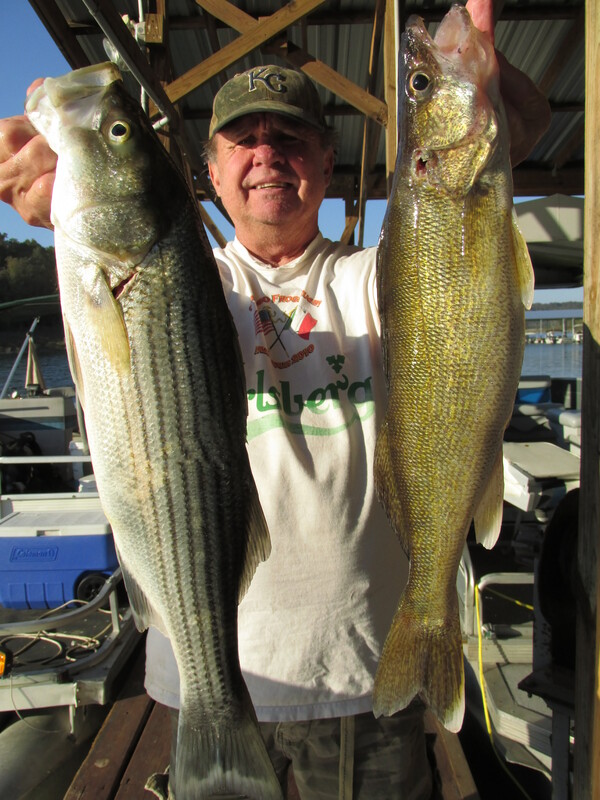 There are still a few walleye and stripers very deep but they are moving north out of the deep water. 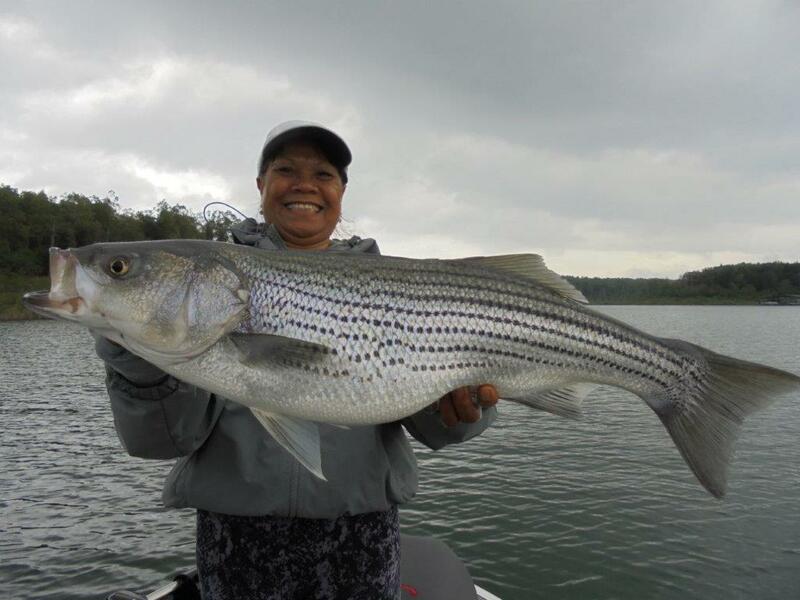 We will see if there is a night bite for stripers in November. This does not always happen but depends on the shad an plankton. If they move or are blown to the bank in the evening there will be. The crappie bite is the best now with the bass next. Spoons and slip floats with minnows are best for crapppie and plastic worms for bass. The fish are not in any special pattern and everything is changing as it always does in October. There are lots of shad and not all of them hold fish. 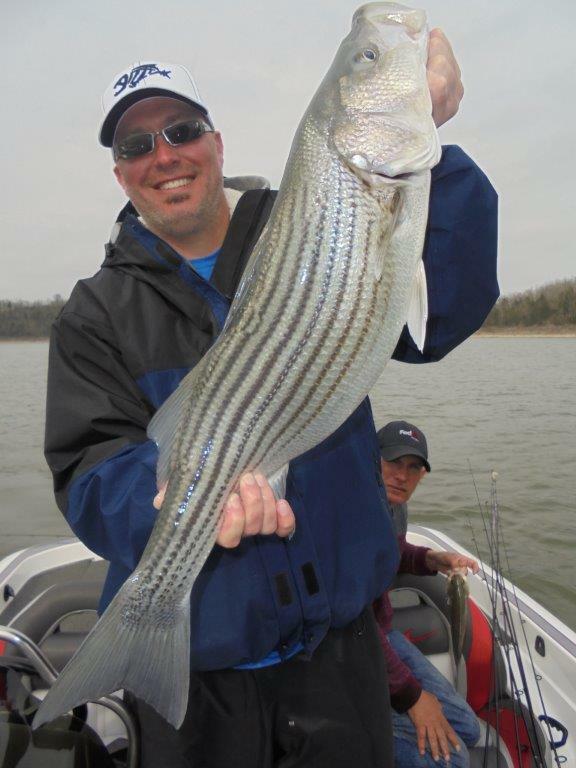 The old saying " find the bait fish and you find the striper is not true. It should be " when you find schools of shad learn how to tell if there are fish on them" if you do not, you will waste a lot of time fishing dry holes. Look for shad with broken schools and not just blobs. Also look for lines and slashing fish. 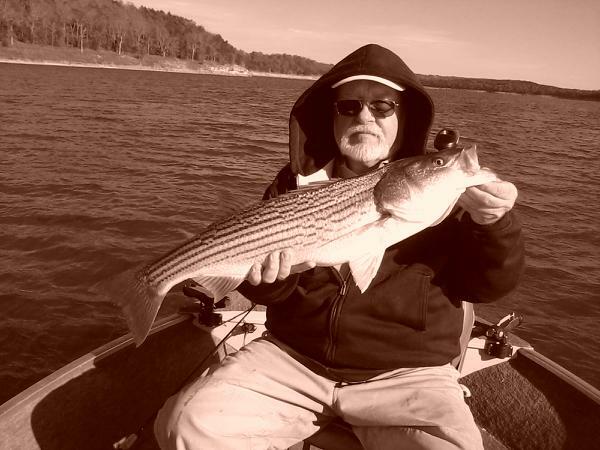 Many times the stripers are under the shad but not always. It just takes time and a good locator. It is also hard to stay on them after you catch one. 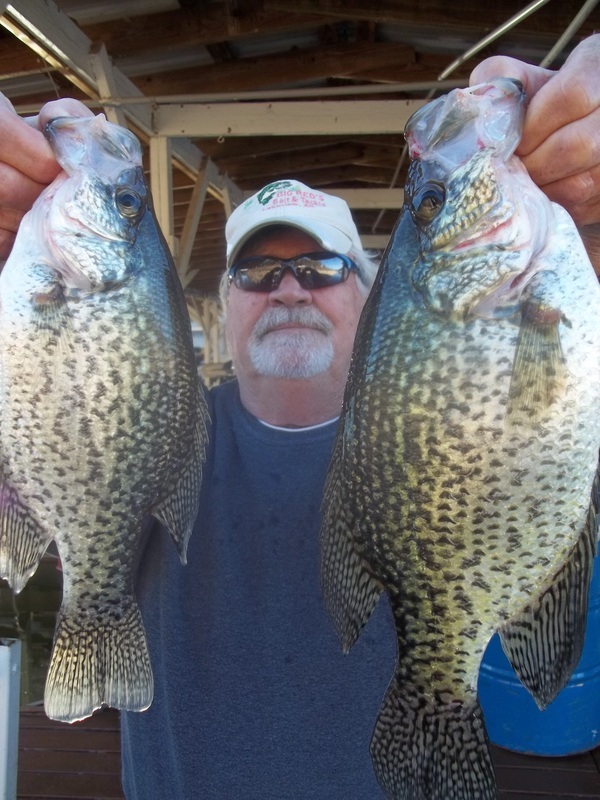 I like to spoon them but others like to drag live bait with several poles out. If you do this long enough you will catch some. You can stay on them easier vertical jigging a spoon. Bluegill fishing with jigs and nightcrawlers is also good. Look for shad part way back in the wind blown creeks in 45-ft. of water and the fish are 30-ft. down suspended. All species are together. Brush piles in 25-30 feet inside main lake points are all holding fish. 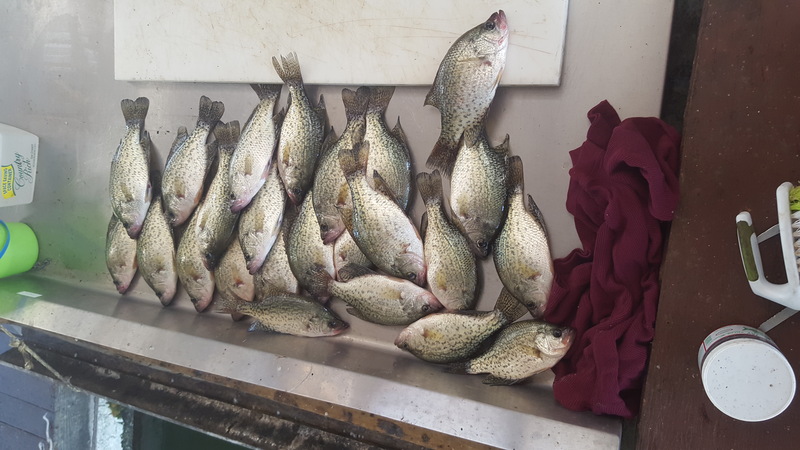 Mostly bass, crappie and bluegill. Go to www.blackburnsresort.com and click on scuba Steve's blog for a daily report. A lot has changed in the lst few days. First the lake is dropping rapidly and is at 562.84 and dropping about 3-1/2 inches a day with continous generation. Surface temperature is 86 degrees. There is a thermocline at 20-feet with a mud line (area of very cloudy water) just above with cold water below. There are a lot of Bass, bluegill and walleye in this area from 19-24 feet. Many undersized bass but some very nice walleye and also many bluegill. Fry of all speces are around cover at this depth attracting the big fish. There are many very small shad and bass that have recently hatched in this area. The creeks are not very clear with a visibility of about 7-feet down but the main lake is pretty clear down to the mud line and then pretty good again in the cold water below the thermocline. 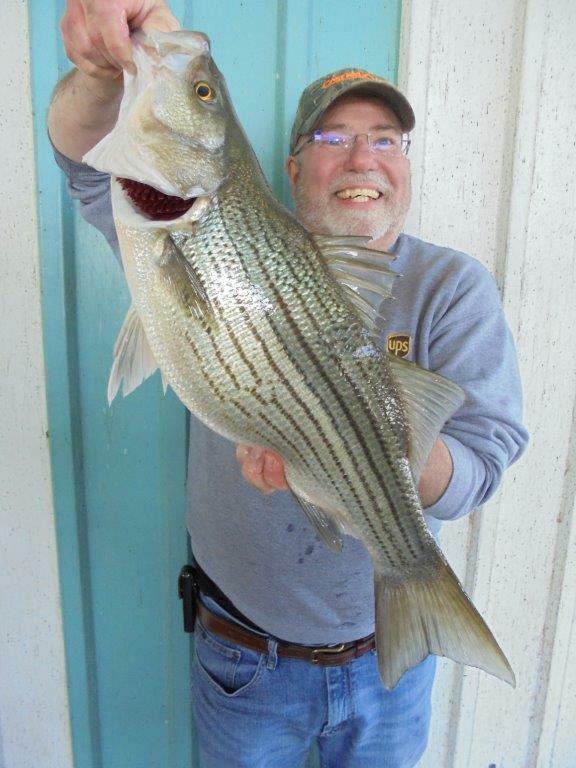 Some stripers have gone deeper in 55-60 feet and can be caught on the spoon. 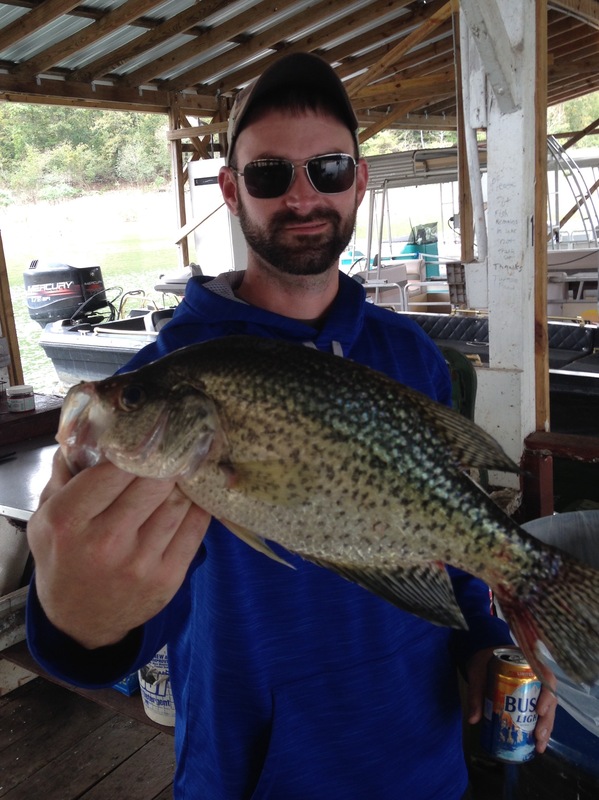 Crappie are under docks in the shade but are pretty slow biting. The ones I am catching are recently spawned out and still bloody and roughed up. Big ones. Walleye and bass are the best bite now with spoons for the walleye and soft plastics for the bass. Bluegill have spawned and have moved to cover. All of this typically happens now with no specific pattern but they will move deeper with the thermocline and stay on cover or near it with the bait fish. Some of Blackburns Brush piles are coming into play and will be just right soon. We need the level to get to 560 for the brush fishing to get good. There are a lot of fish out there. Get out early, take the middle of the day off and fish until sundown. You can still get a cabin at Blackburns for $75/day for two people and we have 11 pontoons for you to rent at low prices. Our big pool is open and ready for you to enjoy. Why pay more? The lake level is 562.09 and is still rising with very little generation. It should be 553.75 and the top of the flood pool is 580. The main lake is clearing and the creeks are still very stained. Surface temperature is still in the high 50's and very slow rising. 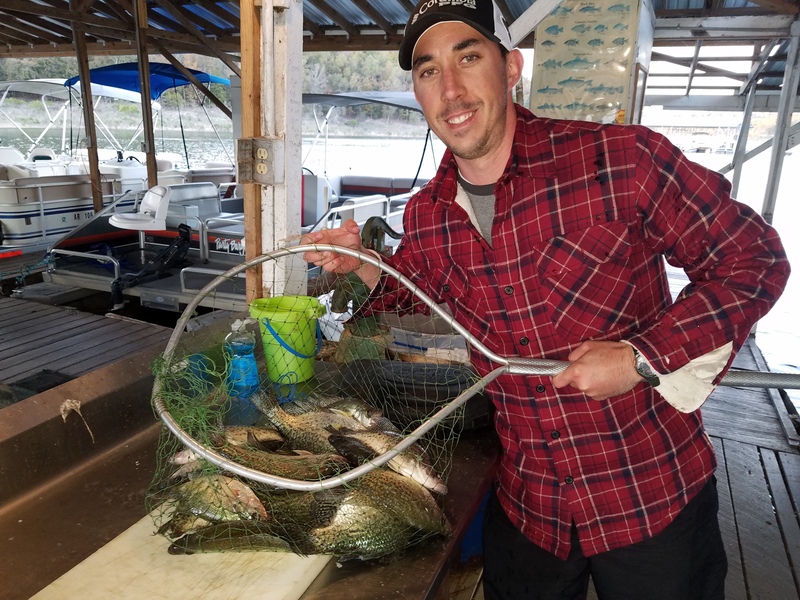 The best bite now is white bass and crappie. 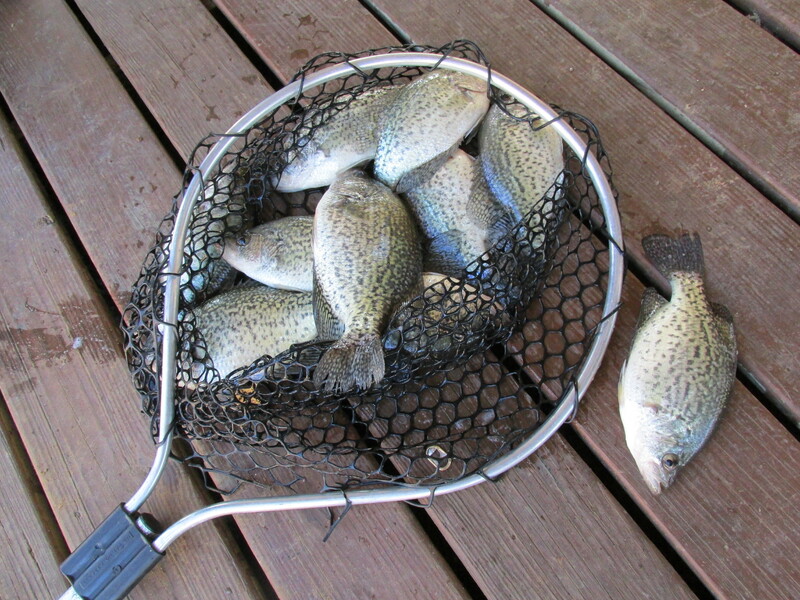 Crappie have moved to the bank in the backs of the creeks to spawn and the males have already made their nests. Jigs, grubs and minnows are all working well. 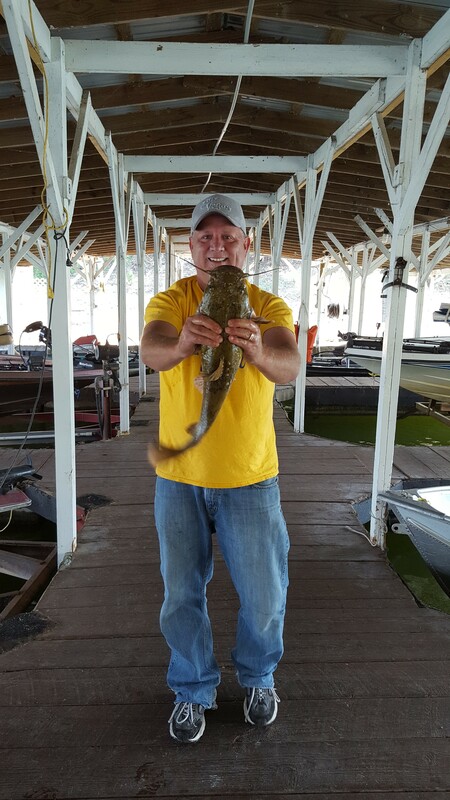 Flathead catfish have moved part way into the creeks and are biting on jugs and trotlines with live bait. White bass are the easiest to catch now and are in 45-ft. of water 25-ft. down are are biting on spoons and anything with a spinner. Bass fishing is just fair with smallmouth being the best. Finesse worms and smaller creature baits are working. 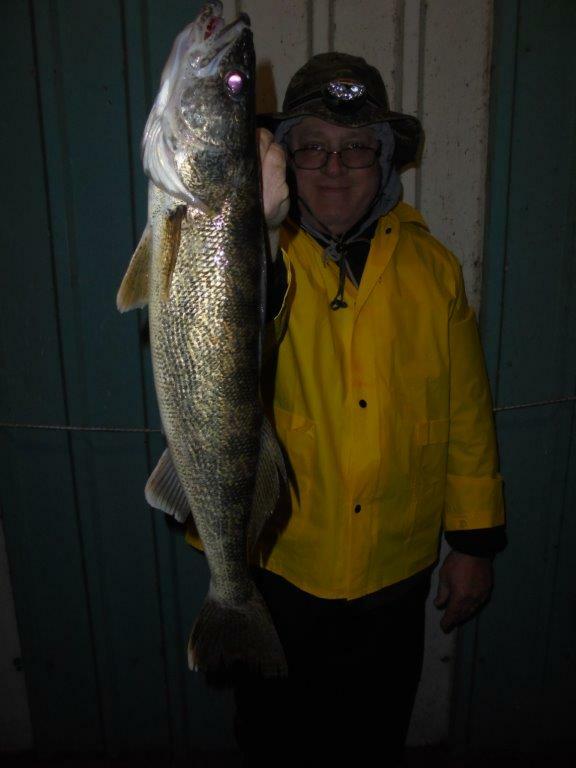 Walleye have moved into their spring places and are near the bank in 20-ft of water on the main lake on the drop-off. Spoons and soft plastics are the best. Fishing is picking up and this has just happened in the last few days. Carp are in the back of Blackburns Creek spawning. good for bow hunters. Top water bite will start when the shad have spawned and that should have happened April 15th. Everything is slower than normal, whatever that is, do to the cool weather and cold nights. We will probably just go straight to summer. People are taking advantage of Blackburns Resort's low cabin prices as well as the selection of 30-rental boats and we are very busy. You can get a 1-bedroom cabin for $53/ day and a free boat stall. All cabins have covered porches for rainy days and to get out of the sun and none are duplexes. No charge for trolling motors on any of our boats. Compare rates before you book. Why pay more? The lake level is 559.54 and pretty steady if they keep running one generator. If they quit it rises again. They cannot seem to run both generators. We received 5-inches of rain in March and the average is 4. The normal high for today is 67 and we will not get anywhere near that. The surface temperature is still in the mid 50's and does not want to rise. It has been the same for weeks. The lake is trying to clear a bit but is still very stained green with just a couple of feet of visibility. The brown water is mostly gone but there is still some in the Bennetts area. The fish want to get active despite the cool water. 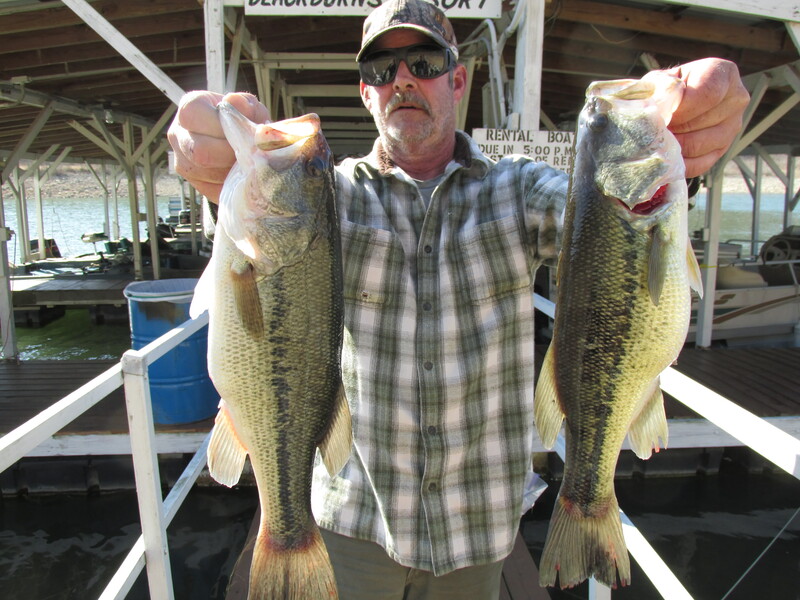 Temperate bass are biting better and several are coming in. Trolling an umbrella is working the best with jigging spoons next. 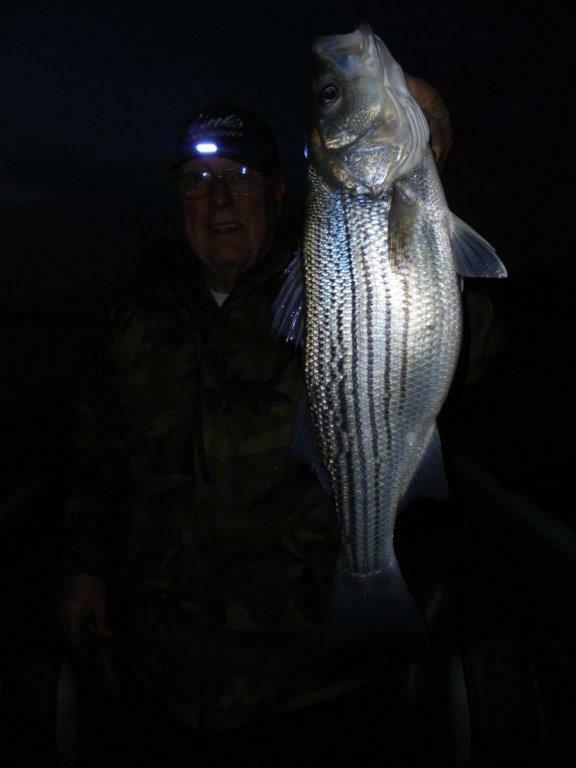 There is an after dark bite for stripers simulating a spawn in their normal places on a stick bait. Walleye can be caught before dark on shadowy banks on soft plastics. 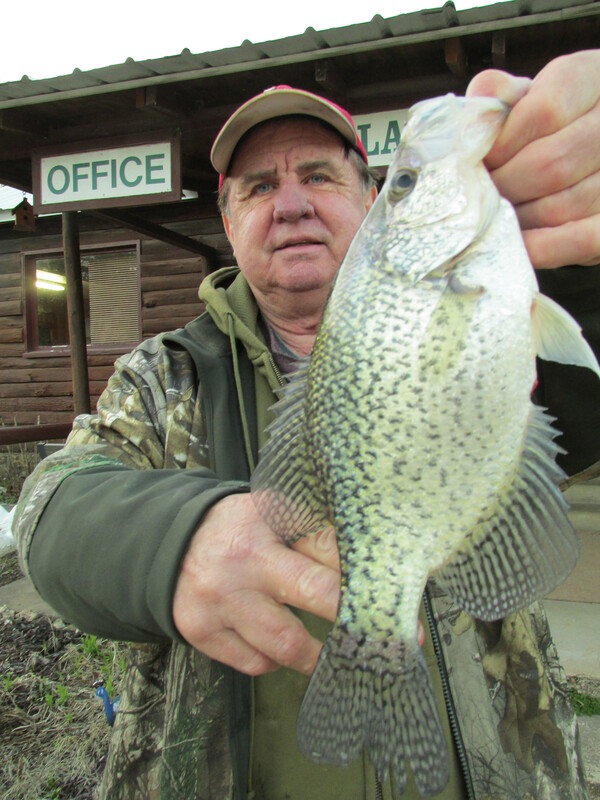 Some crappie are on brush in 25-ft. of water shallow and some are still in open water on shad. You can catch some good ones if you know where to go. Bass fishing is getting better and better and they are full of eggs as are the crappie. They just need a little heat to hit the beds. We need some warm nights in the 60's but are not getting any of those. Things should get a lot better as the top water bite begins in earnest. That is usually April 15th and gets better as the middle of May approaches. Fishing in general is pretty good but not great. 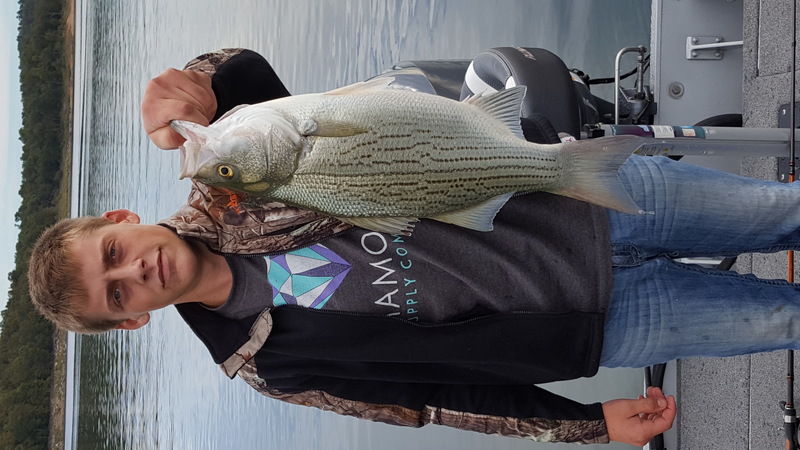 I wish more big stripers in the 25+ range were showing up. 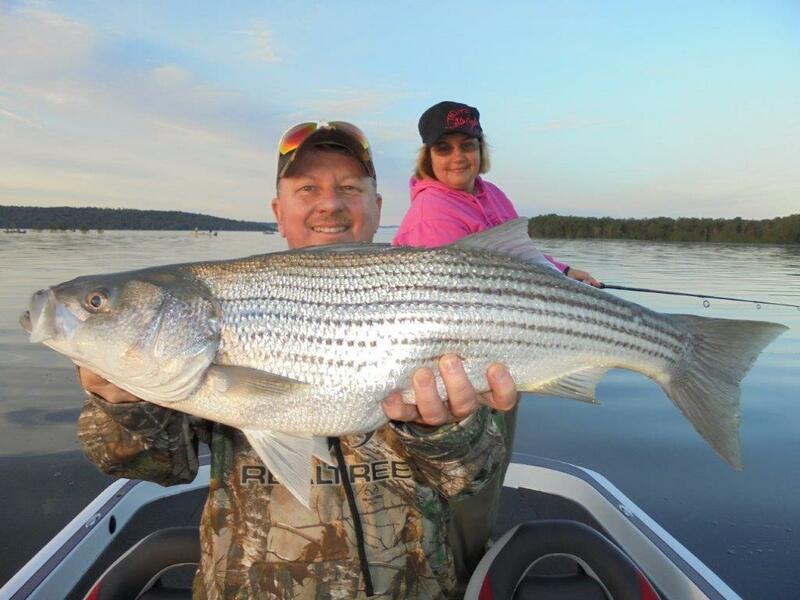 People are keeping a lot of stripers in the 6-10 lb. range thinking they are big and they are not. Things are just a little slow coming around but will get there. I am catching some good fish everyday but it is not easy. The lake level is 553.36 and rising with no generation. The White river at Newport has dropped to 17 feet and it could be 21-ft. with current rules. They need to drop Norfork, not because it is too high, but in order to have enough surge capacity to handle the spring rains. We are dry here again. It was very warm yesterday and approached 80 degrees and the main lake surface temperature is in the low 50's with the creeks being warmer. Normal ambient highs are 61. 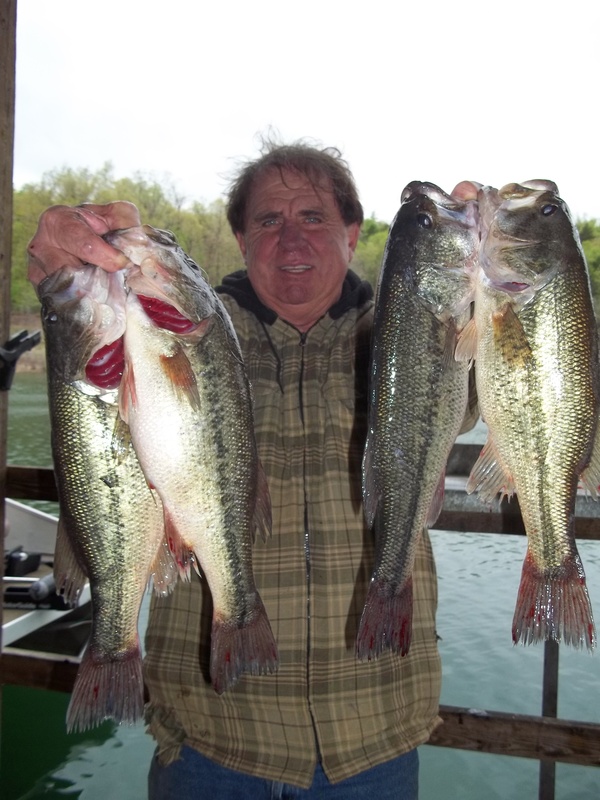 I am finally writing this report because the spring temperate bass fishing has begun. 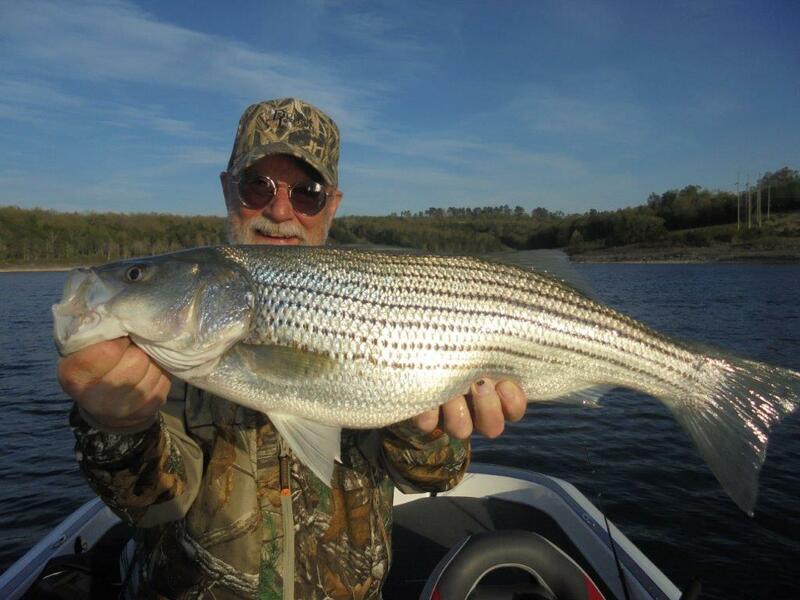 Stripers, hybrids and big white bass are all biting on the spoon in 15-30 foot of water on shad. The Bink's spoon is the preferred lure vertically jigging it. Fishing has gone from fair to good in just a few days. Some are trolling live bait also. Blackburns has some umbrella fishermen coming in tomorrow and we will see how they do. Bink reports catching all he wants now far back in the creeks in the warmer water. Some giant largemouth are with the red meat fish. The slug of brown water caused by the heavy rains a few weeks ago is settling out and the lake is in excellent condition. 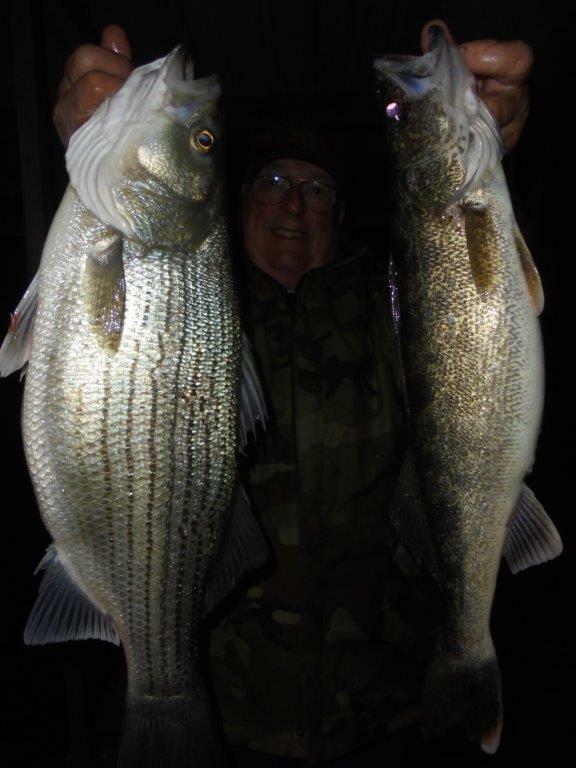 The top water bite at sunrise and the night bite for stripers on the bank on a stick bait are right around the corner. We just need some warm nights. This is an exciting part of the year. It is good to get through early March and the rollercoaster weather. Early March fishing is the worst for me all year and I am glad it is over. Blackburns is opening more cabins everyday and have a one bedroom cabin for $53/day with a free boat stall. Best price around. The 4-bedroom is good for a large group and is only $130/day and has two baths. The lake level is at 550.53 and is dropping a little over 1-inch/day with several hours of generation. The lake is trying to clear and the surface temperature is 52 back in the creeks and 54.8 in the deeper main lake. The lake is at a good level for this time of year and Blackburn's brush piles are at a good depth. There are cold fronts coming through about every day followed by high pressure and it is really affecting the fishing. The ambient high temperatures are varying from 60's one day and 40's the next. It is not susposed to freeze after tonight for the next week. It is very dry and there is a burn ban on here. We need rain very badly. 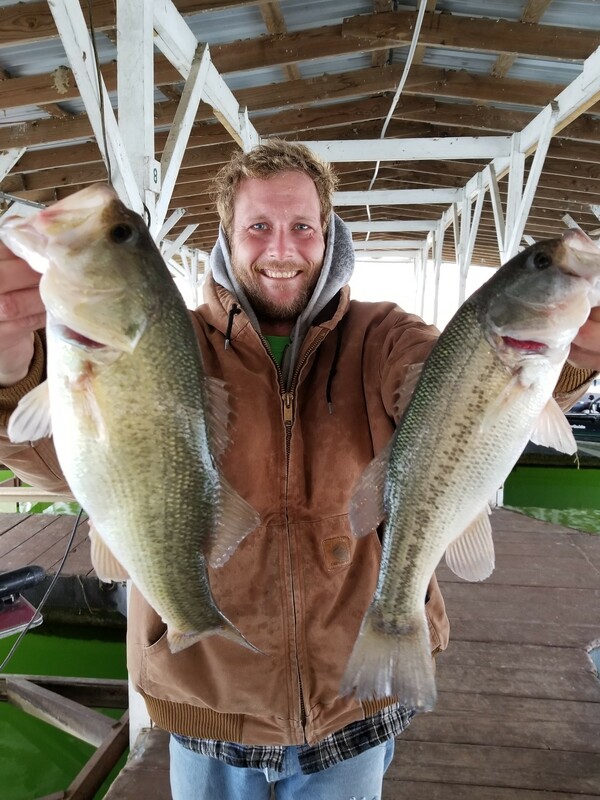 Crappie, walleye and catfishing has dropped off considerable in the last week and open water fishermen are working hard to get temperate bass. One day they catch nothing and the next they find a school of feeding fish and get a bunch. You cannot count on it. They are finding open water fish on the North west side of Cranfield Island in a triangle around the Cranfield beach, Entrance to East Pigeon and the island. Some are also in Bennets around point 1-D near Walkers entrance and Talbot and in the back of float creek. 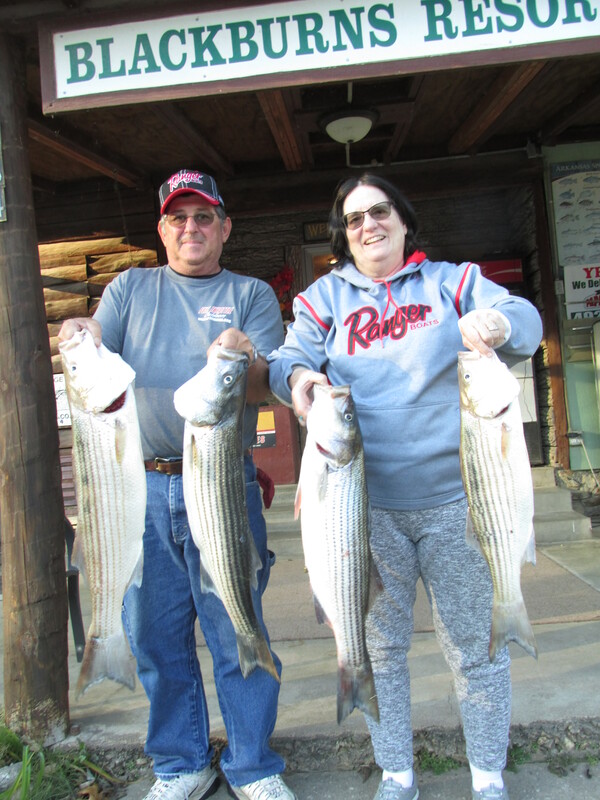 They are catching mostly small stripers, hybrids and white bass. Do not count on what the fish usually do for this time of year because the flood really changed things up. The Norfork river discharge from the dam run brown for a couple of weeks last month and I have never seen that before except for maybe a day after a big rain. 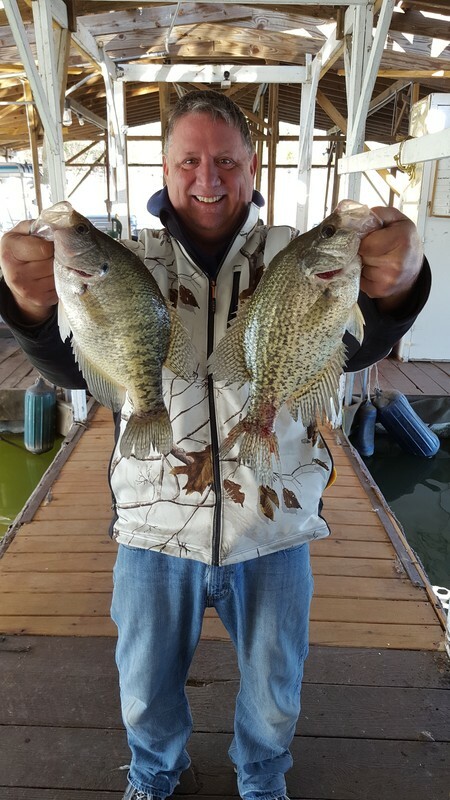 I am usually catching big crappie almost at will in December and was until recently. They are now scarce for me. 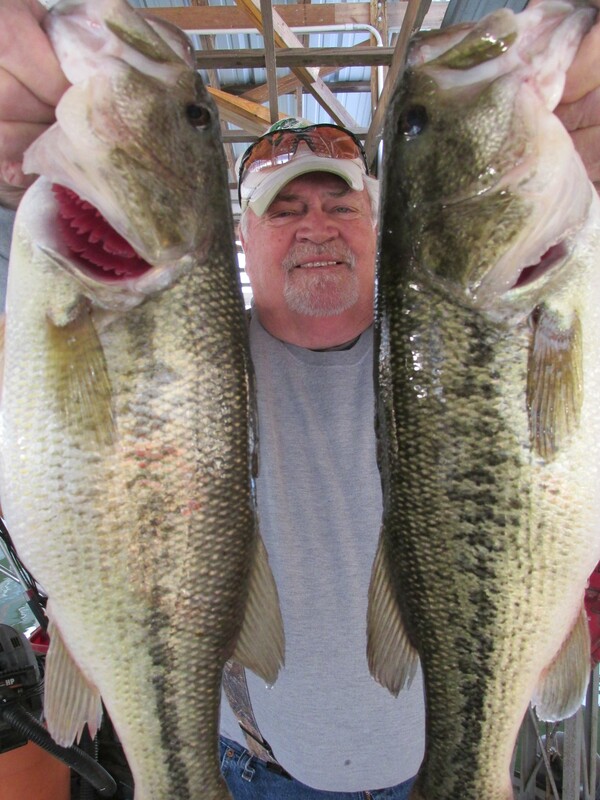 Bass fishing is fair and some good ones in the 3-lb. range are being caught . One time they are next to the shore on the main lake and next they are in 25-ft. of water in the creeks on brush. I caught my limit of good ones on Tuesday and only one yesterday. Sometimes they bite grubs and the next spoons in deeper water and sometimes nothing. The wildlife is very hungry with no grass, acorns or other nuts available. I am feeding them and they are getting very brave to get something to eat. They too are usually scarce during and just after hunting season. 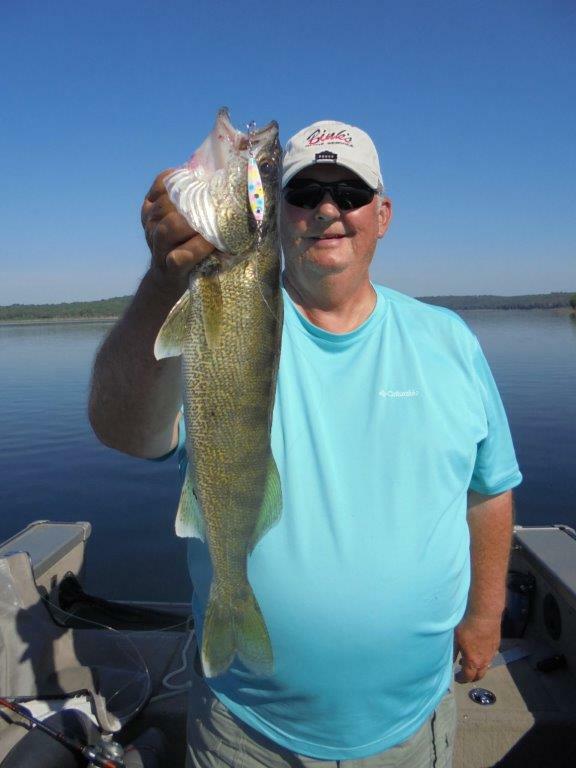 I will work hard to try to find the walleye and crappie and let you know where as soon as I do as I am out there every day and have some very good fishermen reporting to me. Blackburns has cabins starting at $53/day with a free boat stall and all cabins are individual, have covered porches and we have no duplexes and lots of parking. if you have already winterized you boat we have rental boats available at a good price. We are open all year, are closest to town, dining and shopping and have bait. Blackburns guests Brett and Beau Govreau from St. Louis won the Toyota Bass Master team championship and received a boat, trolling motor, trailer and motor totaling $42,000. We like Bass masters. Their two day total was just over 26 lbs. No white bass pictures here. The lake level is 551.67 and dropping just a bit with a few hours a day running one generator. The surface temperature is 59 degrees. The lake is still stained for this time of year with visibility only a few feet down and this is changing daily for some reason. We are very dry and need rain badly. 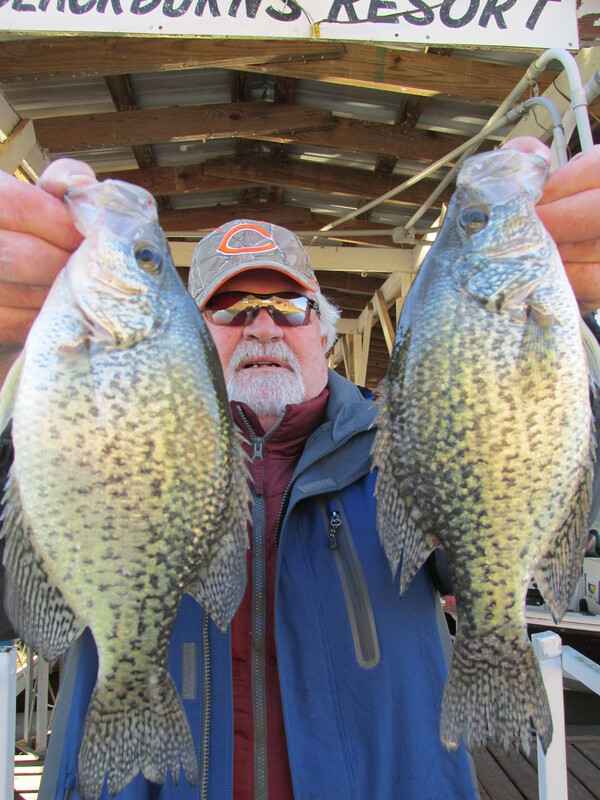 Crappie fishing has slowed but you can still catch some if you work the brush with a spoon or grub. A few are being caught on minnows but not many. I am catching several every day but have to work for them. Some are moving to the bank in the evening and are being caught bass fishing. 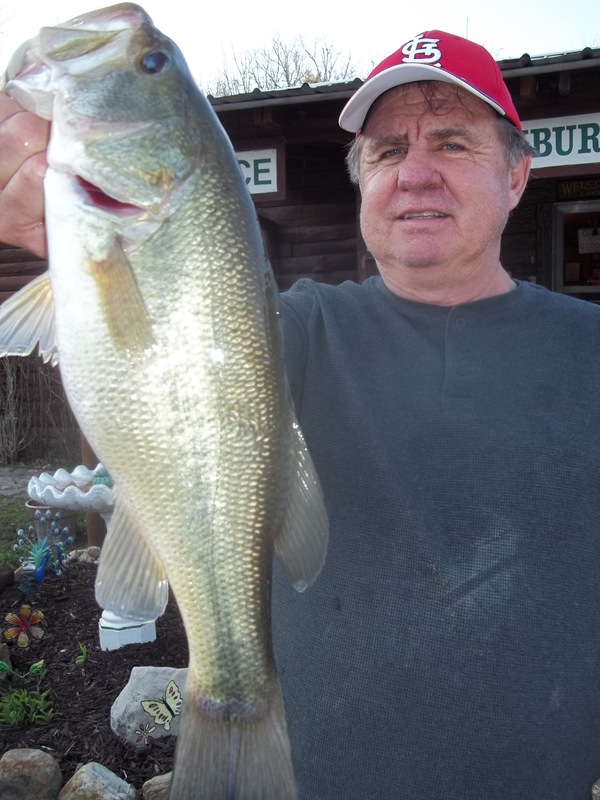 Some good bass are on the banks in the evening and morning but many are still in open water on shad. There are many shad everywhere and most do not have fish under them. 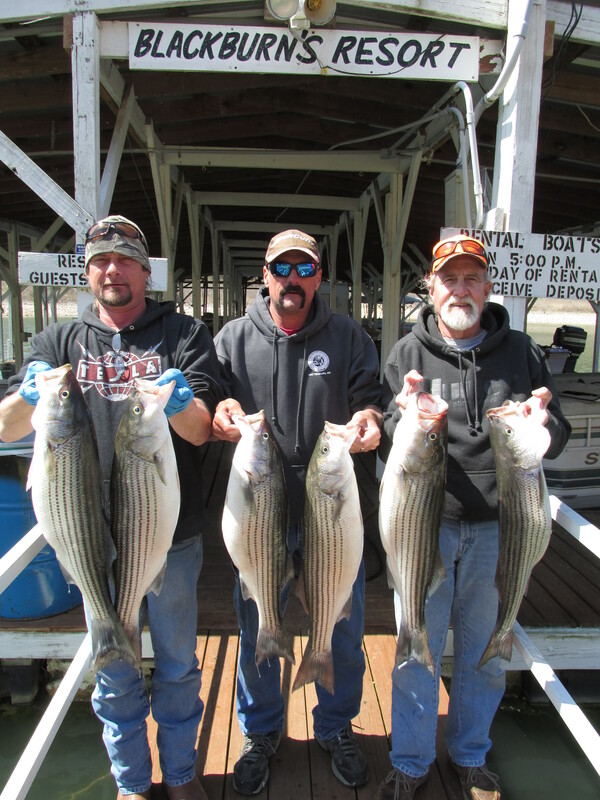 Some stripers and hybrids were schooled by points 1-c and 7 but this is old news. You have to move around a lot to find any red meat fish feeding and many are small. 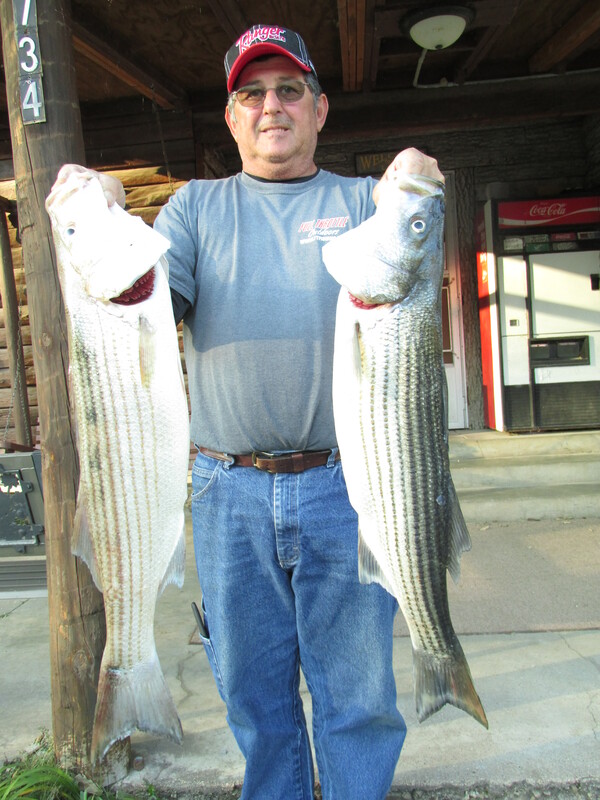 I am concerned about the numbers of large stripers with the summer kill. There are not nearly as many as usual. 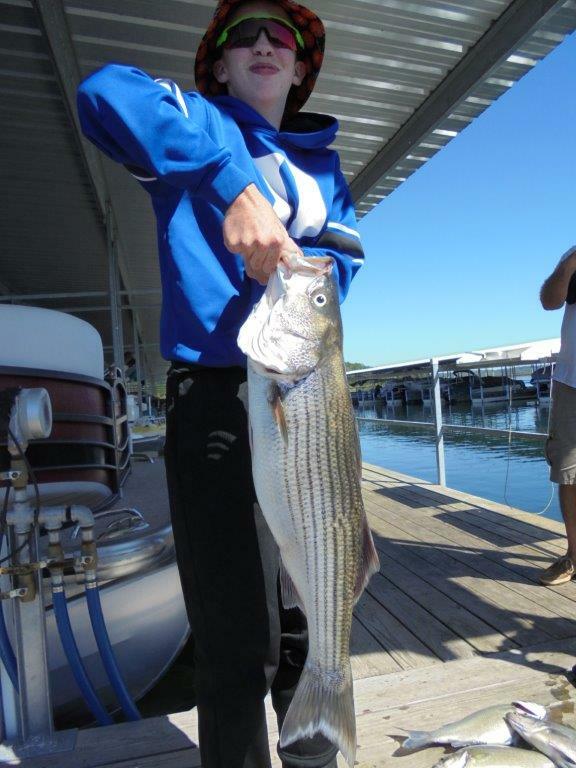 There are many small fish with hundreds of them and white bass about 8-inches long. 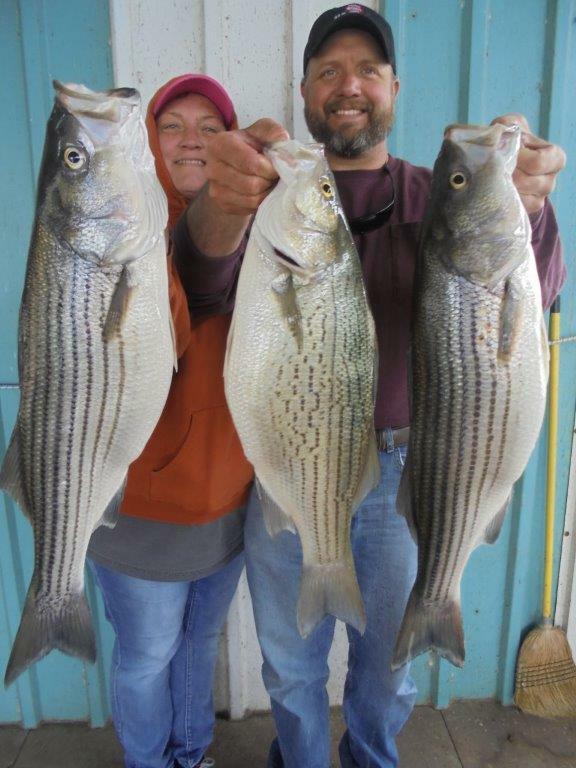 They are changing the law to eliminate the 20-inch minimum for stripers in the summer. That is good and it should not have been implimented in the first place. All of the fish caught out of deep water die and venting does not work as some people proclaim. 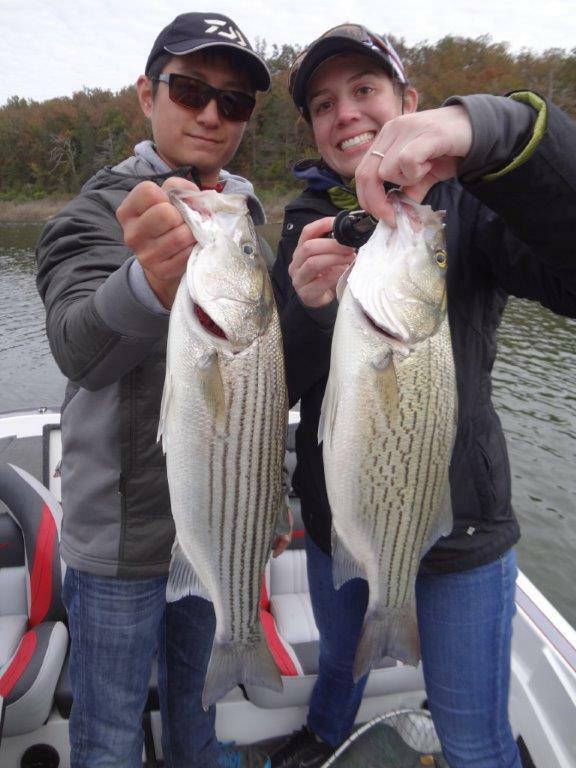 There were small stripers that were released floating around all summer. Culling also should not be allowed. Catch your three fish and quit. A few walleye are coming in but most are also small. The night bite has not happened this fall but if there is any it could happen with the full moon of December coming up the 3rd and the surface temperature still approaching 60. 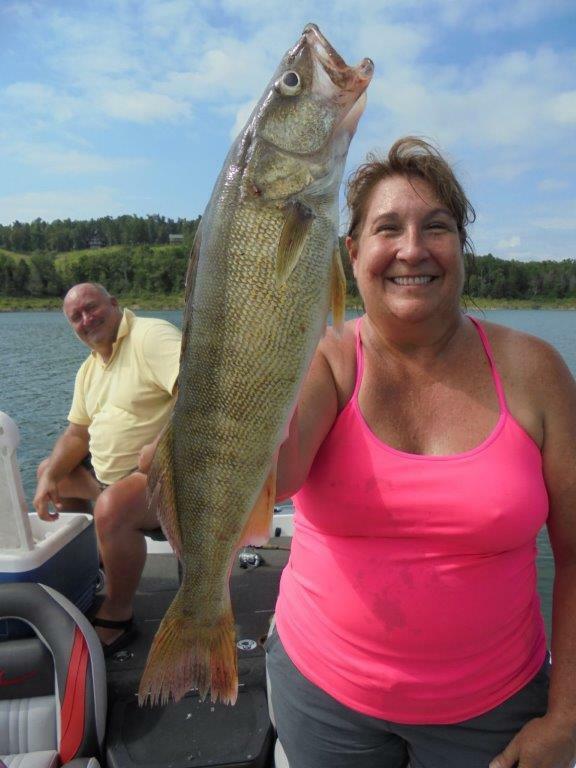 I should and usually do catch walleye this time of year but the nombers and size are low but an occasional big one is showing up. Not many were caught by fishermen and very few by scuba divers this summer so they should be there. If you use live bait, put out a half dozen rods, have a good locator, and troll through enough shad you will catch some fish. 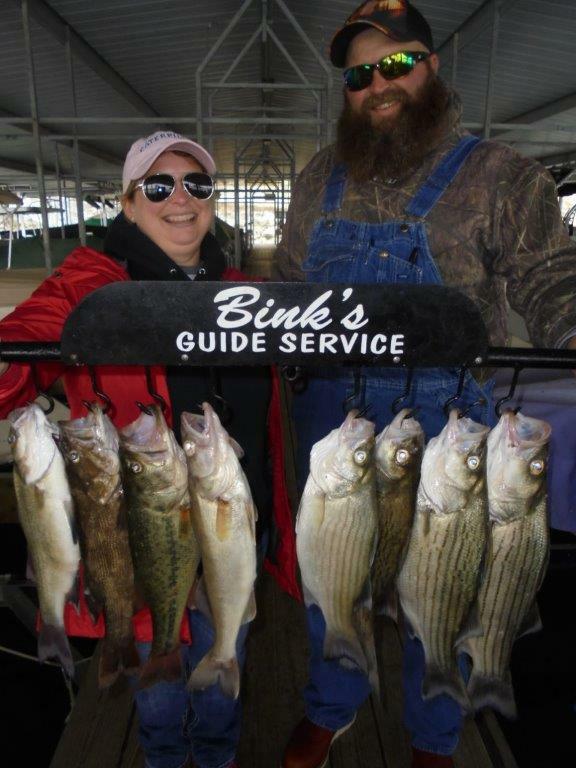 I am spooning brush for crappie and catching white bass and bass. My brush is at perfect depth now and the fish I am catching are mostly at the 25-ft. level. There are shad just outside brush in deeper water but I am not catching much off them. Bass fishing in the evening on the bank is getting better and the fish are getting bigger. The big fish are there. I bet the Bass Masters will catch them next week. They always do. There will be a lot of spinner baits and cranks baits bounced off the shore next week. The 1/8th and 1/4 ounce Bink's spoon is working for about everything down to about 30-feet and then I change to the 1/2 ounce. The blue one is my favorite. Try to keep your spoon staraight up and down. The weather is to remain warm for the next several days. 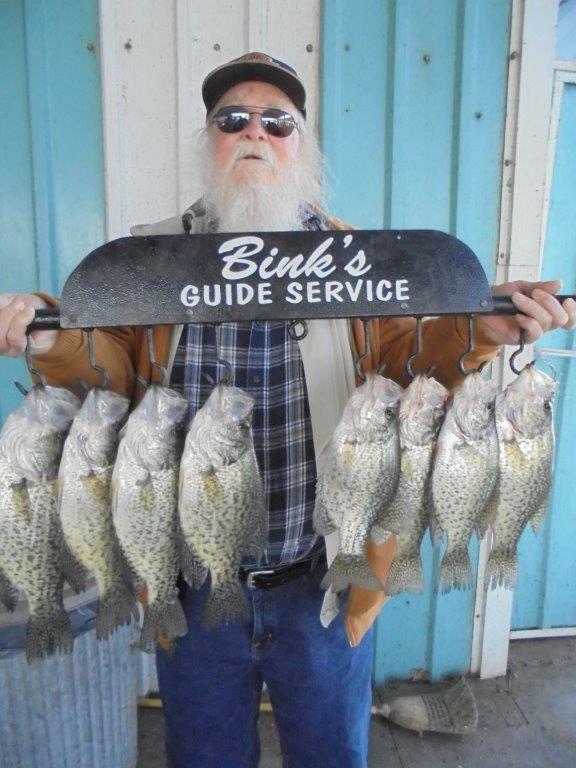 Blackburns has several fishermen in now and they report the morning bite is the best. They are taking advantage of the low cabin rates and free boat stalls. Some places close for the winter but Blackburns is open all year. The lake is in excellent condition. The lake level is 553 and dropping very slowly with just a little generation. We had a couple of cold windy days but the last few have been in the 60's with light winds. It rained a bit last night but it is to get in the 80's this weekend. We received just under 3-inches of rain in October. The surface temperature is 65 degrees and the creeks are starting to clear. 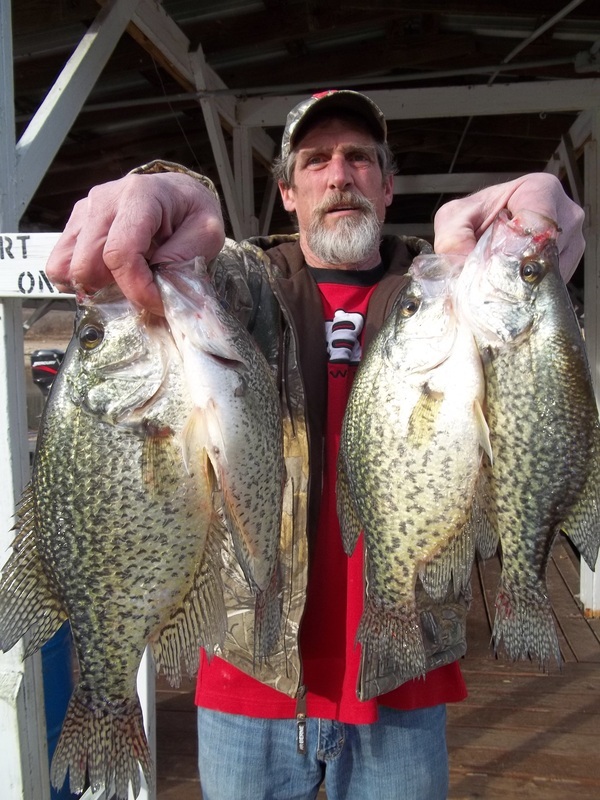 The warm weather will slow the turnover but it has not affected fishing much. Lots of shad are in the creeks with the wind blowing in but most of the fish under them are small. They are coming up all over just before dark. I am fishing mostly main lake except when it is very windy and I move out of the wind to the creeks. A few things have just changed. 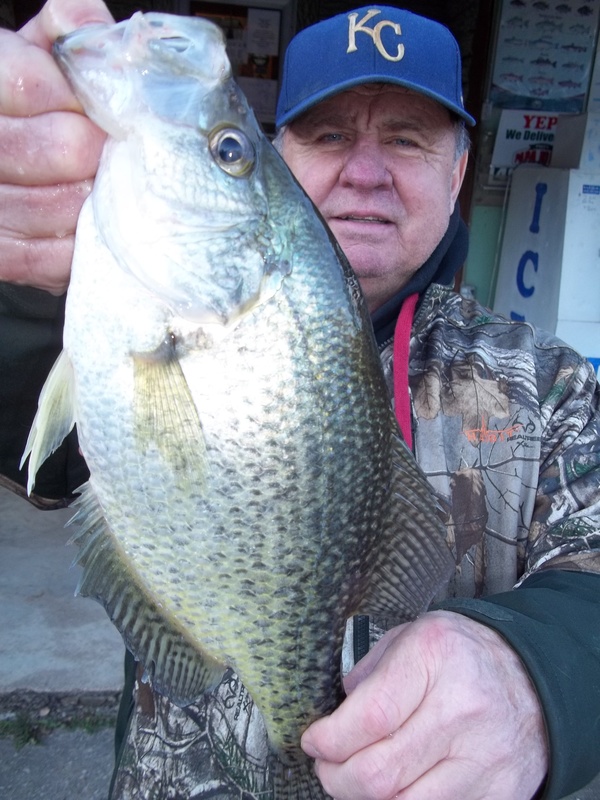 Crappie are still on brush at 25 ft. about 8-ft. down on minnows and when spooning they are hitting on the way down. I started catching black bass on brush near the bottom yesterday and some nice smallmouth on the steep banks on the north side on a grub from 6-12 feet down around Cow Point. 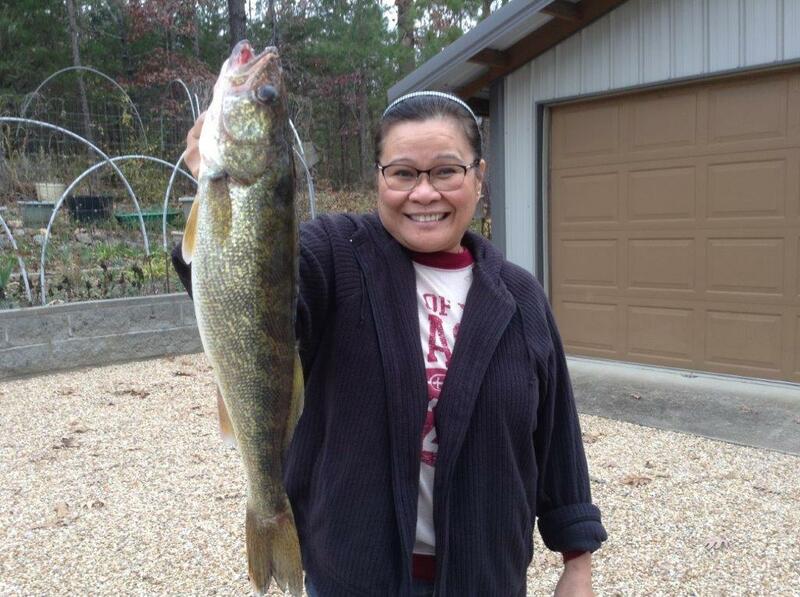 I have been fishing for about 3-hours everyday and am putting from 8-11 keeper fish of all kinds in the trophy pond. Many schools of shad have no fish around them so if you are looking for open water fish you have to keep moving. They are not jumping in the boat but you can catch some if you work at it. Those of us that have been here a while call the fall bite when the walleye start moving to the shadowy banks just before dark and can be caught on soft plastics and the red meat fish move to the banks near Cranfield Island and Near Quarry Marina after dark to feed. This usually happens, if at all, near the full moon in November but it is the 4th this year and is too early. Fall fishing is stick bait fishing but it also is not happening yet. 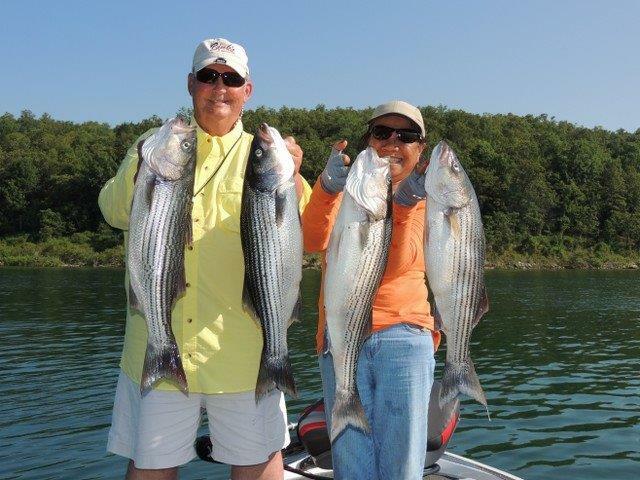 The stripers are mostly 5-8 lbs. and small and it is better to leave them alone for now. 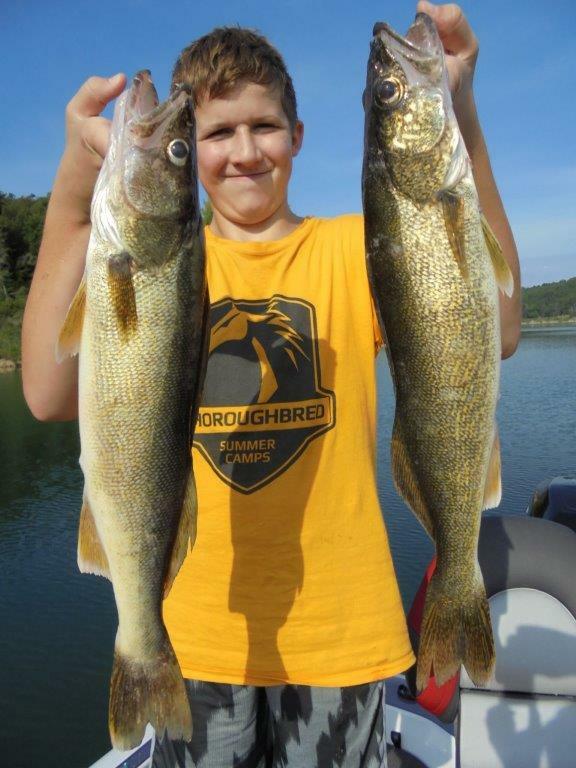 Many walleye are short but about 1-in-4 are keepers. I am seeing large schools of shad on the mainlake just outside brush piles in 38-45 feet with a few smaller fish on them. 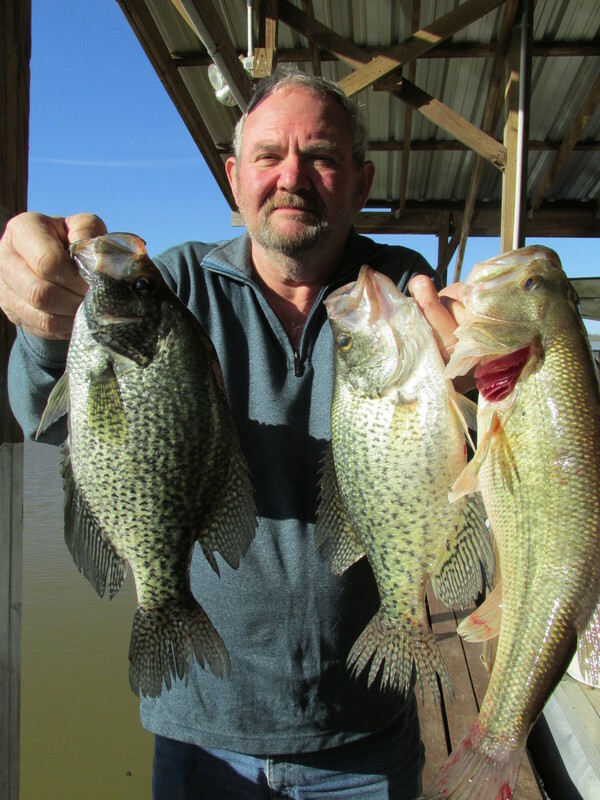 Crappie and Bass fishing is the best now with big ones just starting to show up. 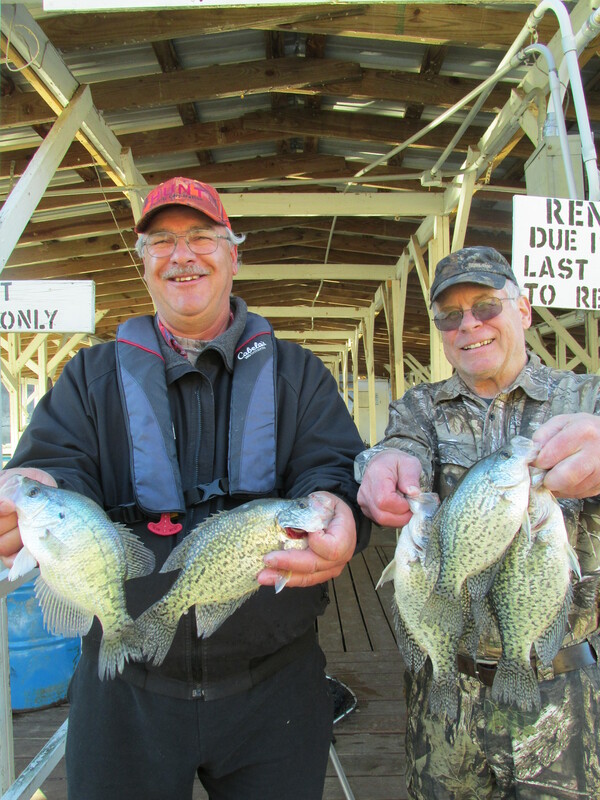 Crappie are pretty much on all brush in the 25-ft. range with a lot of them being caught. The numbers will go down but the size will go up as the water cools. I am catching more large ones everyday. They will come up shallow as the water cools in the evening but now set your slip float at 7-8 feet right over the brush. 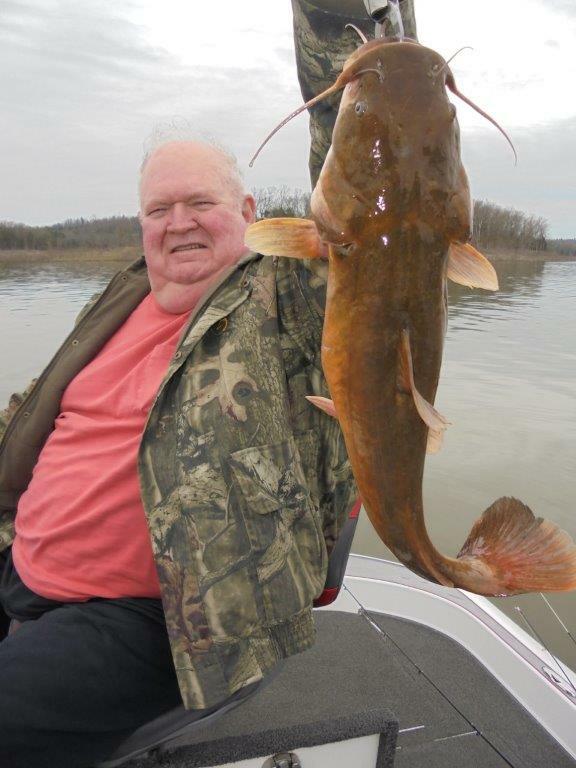 This very warm weather coming up may change things but if you stay around brush you will catch fish. Spoons, grubs with minnows and slip floats with minnows are all I am using and when one does not work switch to another and keep moving. I am catching some good ones every day. Cabins are $53/day at Blackburns with a free boat stall. The lake level is 554.45 and stable with no generation for over two days.The lake is stained with the creeks being more clear than the main lake which is starting to turn green. The weather has been beautiful with highs in the mid 70's and should continue for a few days. The surface temperature is 73-74 degrees. There are small stripers floating by my dock. Someone must be throwing them away after bringing them in. They will not stay alive in a well now. Release them immediatey. 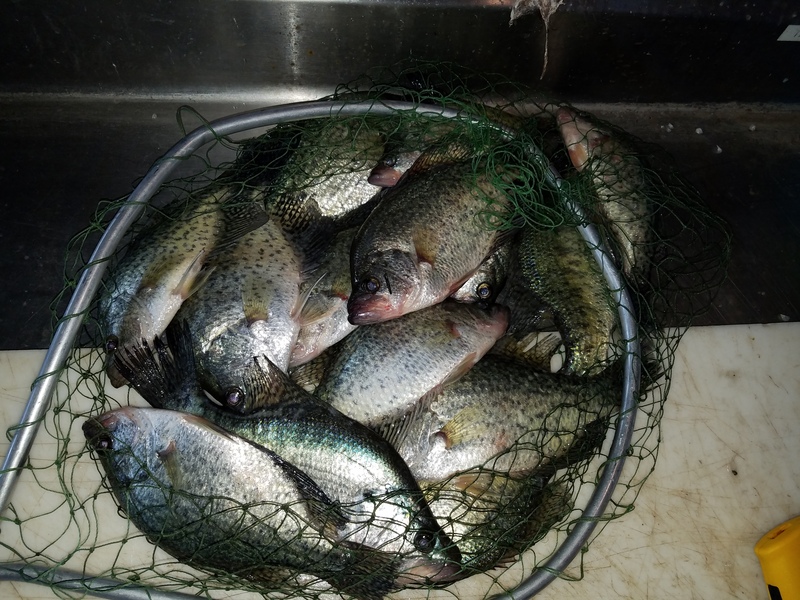 Crappie fishing is still ok and I am catching about 6-7 keepers in about two hours of fishing. About 1/2 are hitting on Bink's spoons and the rest on minnows. They are about 10-feet down over brush. Bass fishing is slow. 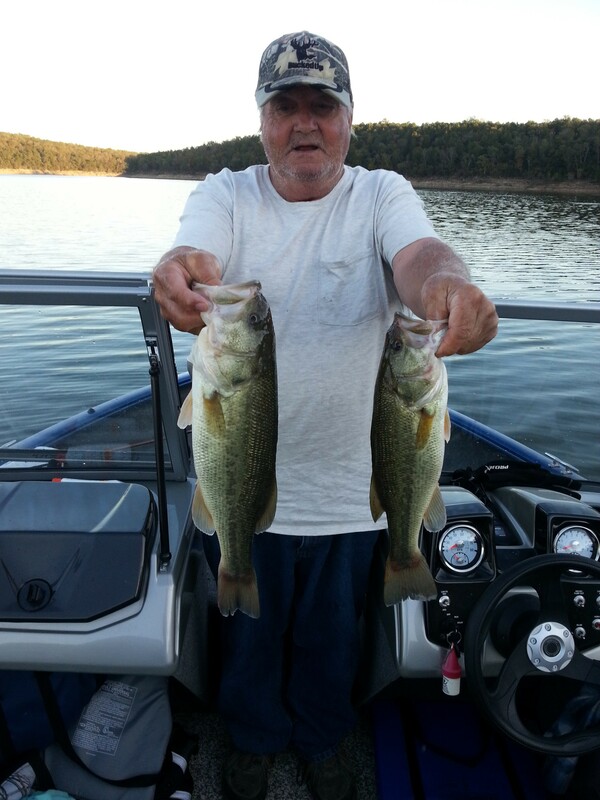 I have several good bass fishermen in and they are working hard for keeper fish. White spinner baits, grubs, and crank baits are best. 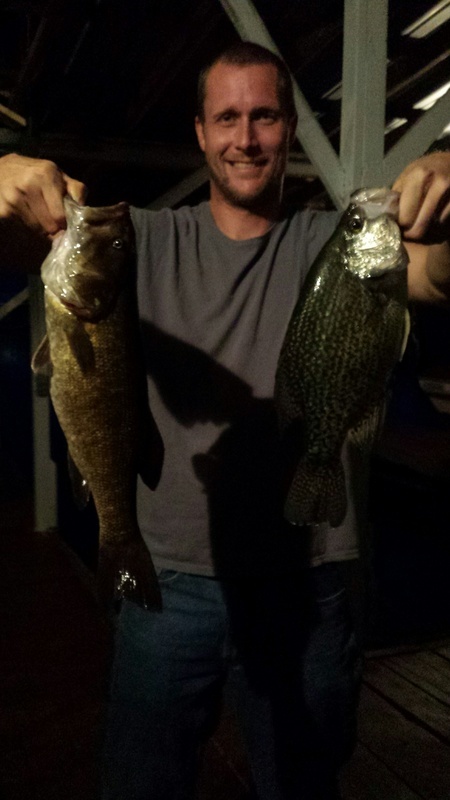 The top water bass are mostly small. The backs of creeks are full of shad about 2-1/2 inches long in the late evening. Spooning is the best technique now for walleye and crappie but some bass are caught on the shelves on wind blown steep banks beating the shore. They seem to hit about 10-12 feet deep around cover. I am usually spooning big bass this time of year but it is not happening now. Bluegill are everywhere and I have some giant ones under my dock. 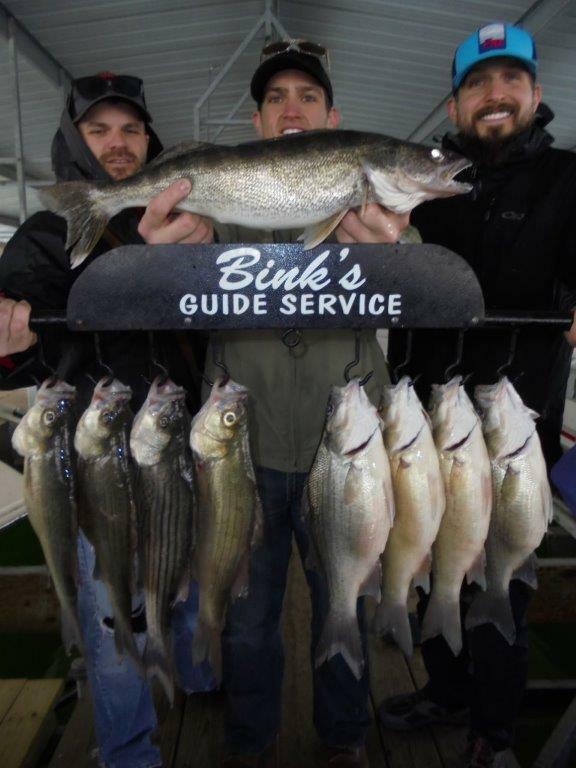 Bink reports catching walleye everyday but only about one in four are keepers. Some open water fish are showing up on the flats between Mallard point and Cranfield Island in 30-ft. of water. A lot of small ones. Yes you can get a good locator, get out about two hours before daylight and net shad, put out a half a dozen lines and troll. Sooner or later you will catch fish if you go through enough schools. Sorry but that is not for me. I prefer to catch them myself. Trolling unbrellas is more effective than that and requires a lot less equipment. I do not do either but a lot of people do. 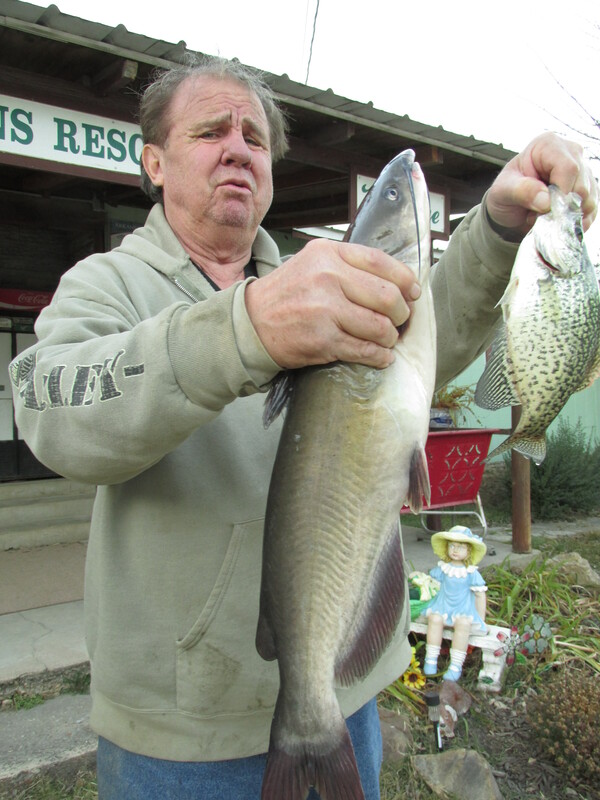 Bink reports the river is running brown for several weeks. What is up with that? It must have something to do with keeping the lake level so high for so long. The only time I have seen it is after a heavy rain. The lake is about to start turnover and may be already. I usually know exactly but have been unable to go diving for a while. It sometimes is quick but more often takes a while. That is why I put in brush for my friends and customers so they can have an advantage. Some nice flatheads are coming out of the brush on spoons also. November looks to be good. There are a lot of fish. I try to keep the pictures of myself to a minimum. It is still very warm here with highs near 90 and and a surface water temperature of 80-degrees. Any changes in fishing is more due to dropping water level than any pattern. 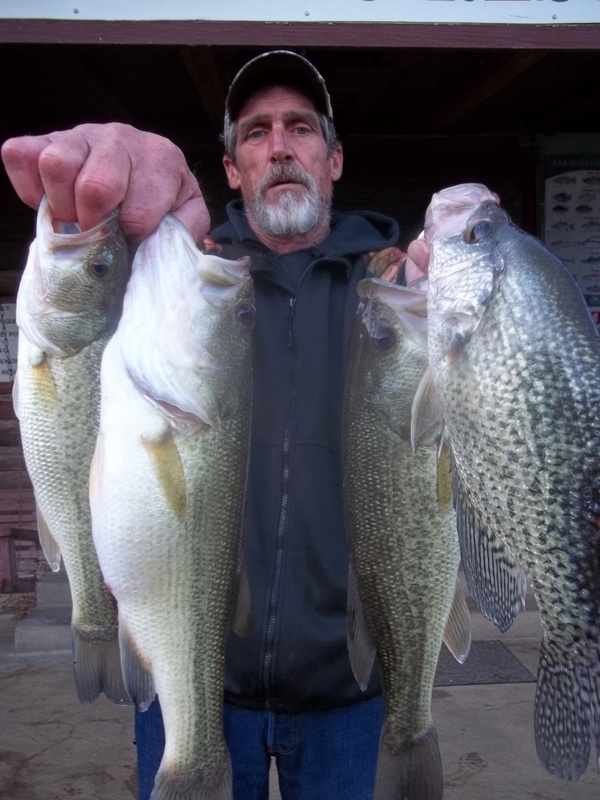 Most big fish this time of year are still in open water on shad but some are on brush at or near the thermocline which is at or just above 29-feet. 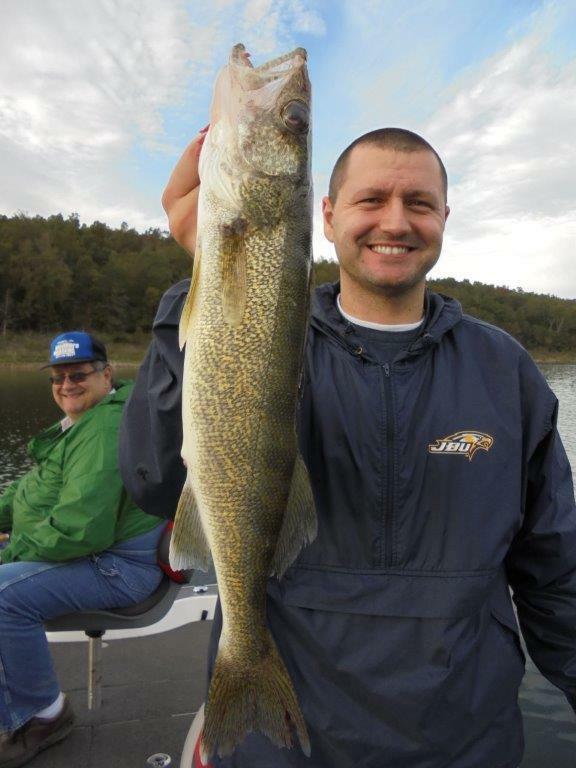 If you can find brush at 30-feet on main lake points there will be walleye on them. I was catching them on flats but they have moved. I wish more people were helping to put in brush piles rather than fishing other people's. They hand out permits in January. 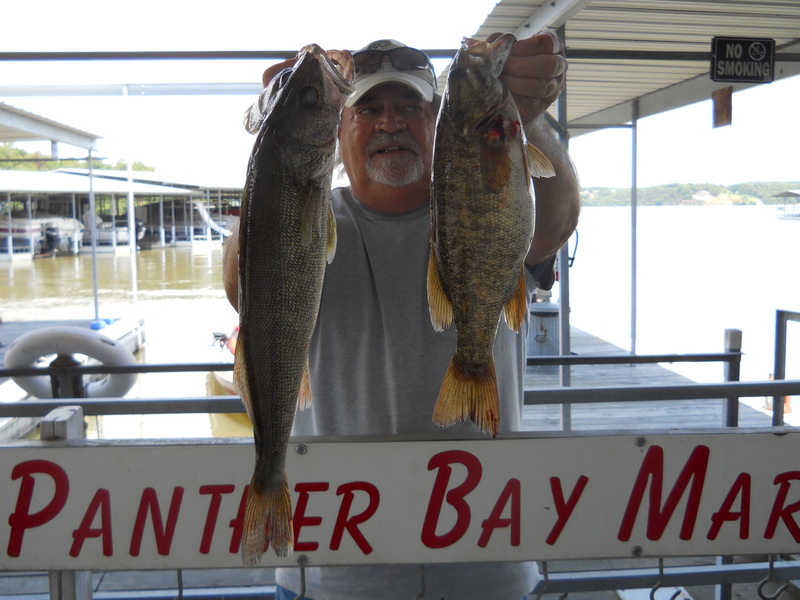 Catfishing is fair on jugs and trotlines with live bait but it is hard to keep the small bass off them. I am starting to try prepared bait but flat heads will not bite anything that is not alive and that is what I really want. 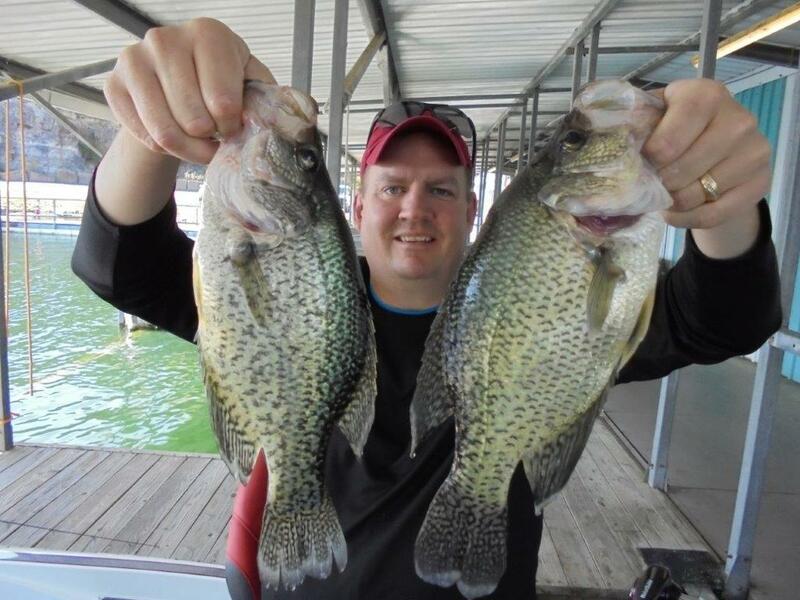 Crappie are in their normal places for the end of September and have not moved from the open water for the fall yet. The ones being caught are left overs from the summer and you can catch out a brush pile easily. I have been catching some every day but no big ones. I call big ones from 15-17 inches and typically catch them in the winter. There are a lot of shad and there is no reason for them to move from open water yet. 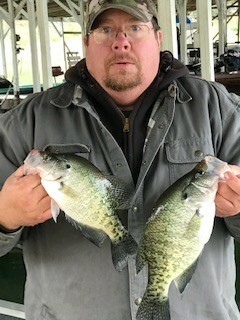 The ones I have been catching during the middle of the day are 8-ft. down over brush at 28-feet and I am using both a 1/4 ounce Bink's spoon and a small crappie minnow with a slip float. My other favorite lure, 2-inch white twister tail turned the wrong way on a 1/16th ounce white with red eye jig head and tipped by hooking a small crappie minnow through the top of the head is not working well yet. I cannot keep the small bass off them. Bait fish are everywhere. 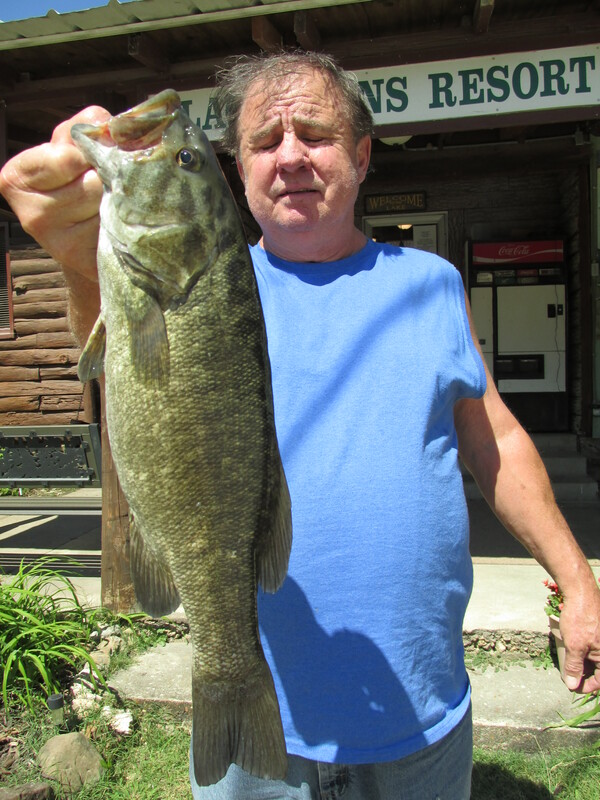 Smallmouth bass are numerous with some big ones being caught but a lot of small ones. Same with Kentucky and Largemouth. I caught some white bass in Blackburns Creek but they were small also. 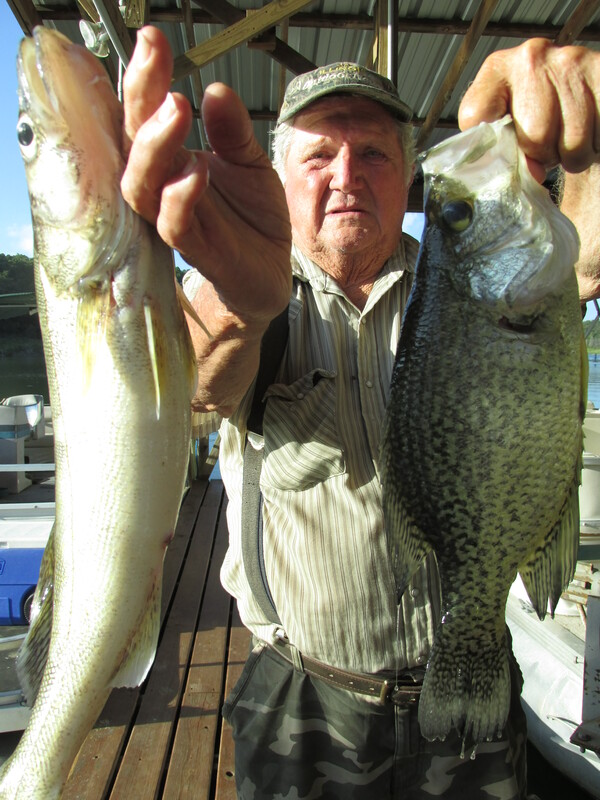 You have to get below the small bass which are very shallow to get the crappie. This looks to be a typical year now with the water level finally going down and the surface temperature about normal. I am very sorry about the striper kill down by the dam but the ones in this area are looking healthy but a little thin. I do not fish for red meat fish much anyway but a lot of people do and to each their own. 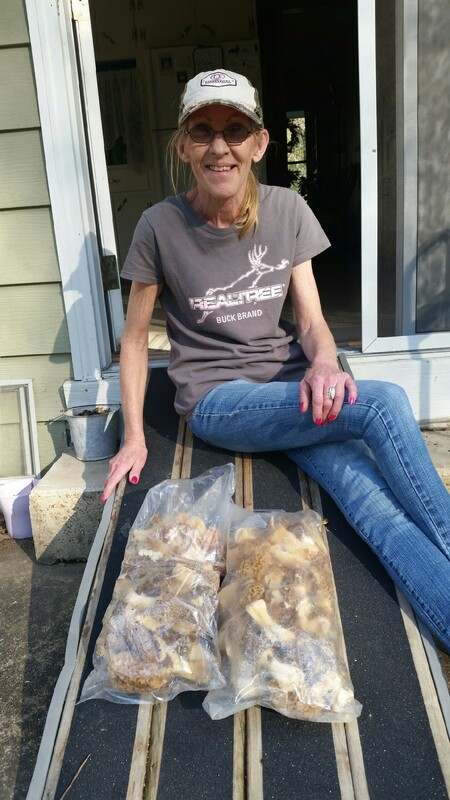 Leaves more crappie, walleye and catfish for me and the trophy pond. Lake is stained and you can see your lure to about 5-feet down on main lake. 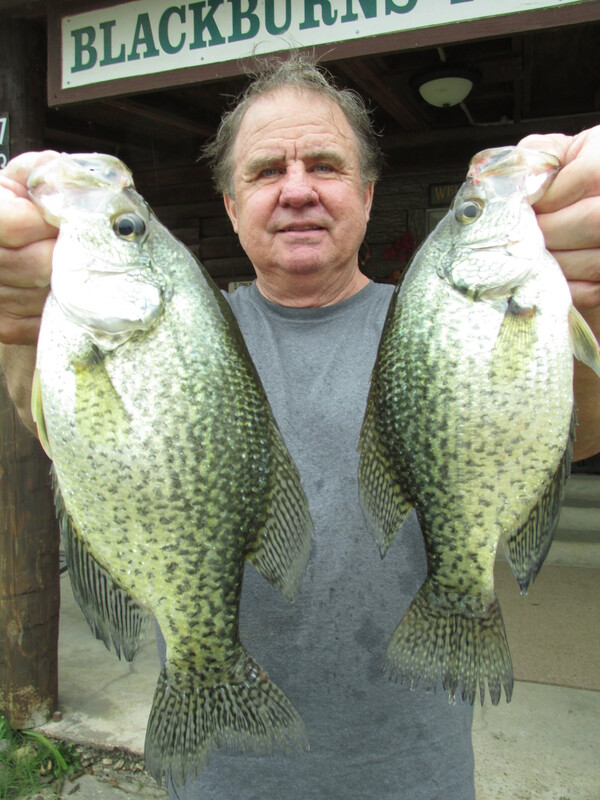 Set your slip float for crappie about 3-feet deeper than you can see the minnow. We received a little over 1/2 inch of rain this week and it helped but we are very dry. Blackburns has it's parking lot by the dock back now and you can walk or drive to it and step right on and cabins are still $53/day with a free boat stall. All cabins have a covered porch and there are no duplexes. Big pool is open and boating conditions are perfect. Things have been the same for a while. The surface temperature is 80 degrees and the lake is dropping slowly and is at 574.85 They have the level at Newport, which is their most important thing for some reason, down to 16-feet and they might start letting some water out when it hits 14. We have had no rain and it is getting dry here. They have been dropping the lake about 1-inch per day with generation less than 1/2 the time. Almost all of the fish are in the buckbrush and trees and under debris including the shad and other minnows. The thermocline is forming and will be at less than 20-feet and the fish will be just above that. As the thermocline goes deeper the fish will follow it as long as there is dissolved oxygen. Just about every bait is working for something, just look for the shad being pushed up to the top. This is happening all day. Fishing is not great but you can catch some good ones working where you can get your lure or bait close to the shore. Points part way back in the creeks are a good place to start. Limb lines are not working very well but trot lines baited with prepared bait are working across the backs of creeks for smaller channel cat weighted to the bottom. I keep trying live bait but the flatheads have eluded me so far this year. Dragging night crawlers around the islands are getting walleye. Bass are everywhere. The debri on the main lake is almost gone and the main lake is clearing faster than the creeks. We need the lake to drop about 5-feet for launching and parking to be less congested with the increased summer boat traffic. They could do this if they wanted to. 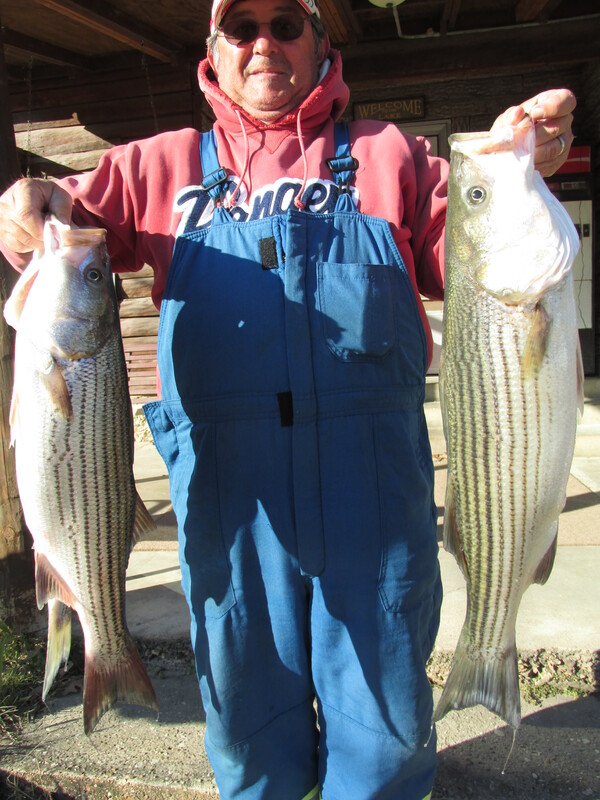 Norfork Lake in general is in good condition. Blackburns is very busy with people taking advantage of our low prices on both cabins and boat rentals and free boat stalls. Pontoon rental with trolling motors is very busy this season. Norfork lake is the best option for lakes in the area for boating. The lake level is 551.4+ and the surface temperature is in the mid to high 60's and the lake is pretty clear except for the pollen. It is to rain for the next couple of days and we seem to get some just when we need it. It is to get very cool this weekend so bring jackets. It is not too wet or dry. We are at a good level on the lake and it is in general in excellent shape. The best bite for now is the top water bite early in the morning but they can come up any time when the shad get pushed up to the surface. Get out there about 6:AM and fish until they go down which is about 9:30 AM part way back in the creeks. East pigeon and middle pigeon are good places to start. If the weather is clear and sunny use a clear spook. It sparkes in the light and resembles a shad in the sunlight. If it is cloudy a white spook and a 5-inch bass assassin will work just fine. Use a spittin image for bass. Learn how to use the spook properly and it will draw them up even when they are several feet below the surface. I like the spook puppy because it is more the size of the shad but the larger ones can be cast further. They always seem to come up just out of reach. Some big bass are with the red meat fish, some are on the bank spawning, some are making nests and some are finished. Bass on Norfork spawn up into the summer. That is not the only bite. Smallmouth bass are on the river channel banks just off the bank as are warmouth. I am catching them from 2-4 lbs. quite regurlarly and in the middle of the day too. Many fish have moved under docks both on main lake and just off. 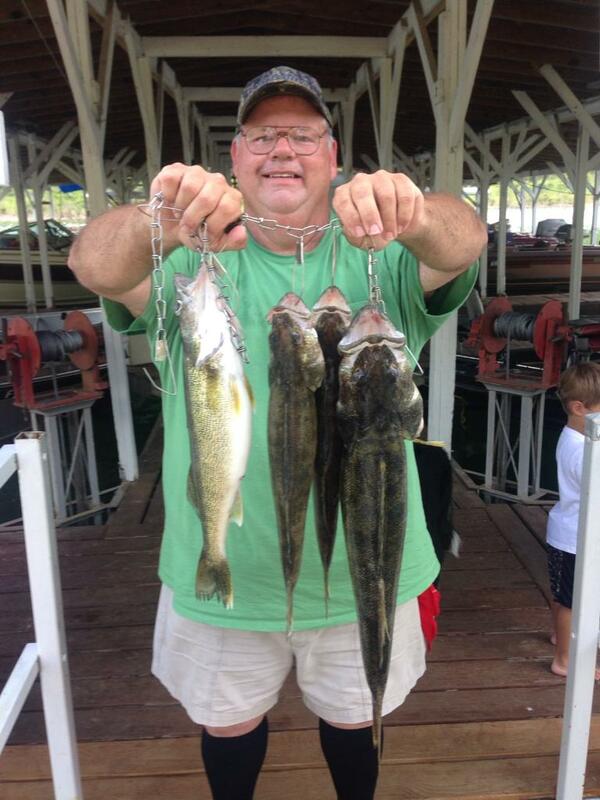 Bass, walleye, crappie and bluegill are loaded there but are hard to catch. They are shallow and can see you. I looked for walleye on the flats around the Islands but could not catch any. It is usually a may thing but the water is too low to bring them in early this year. 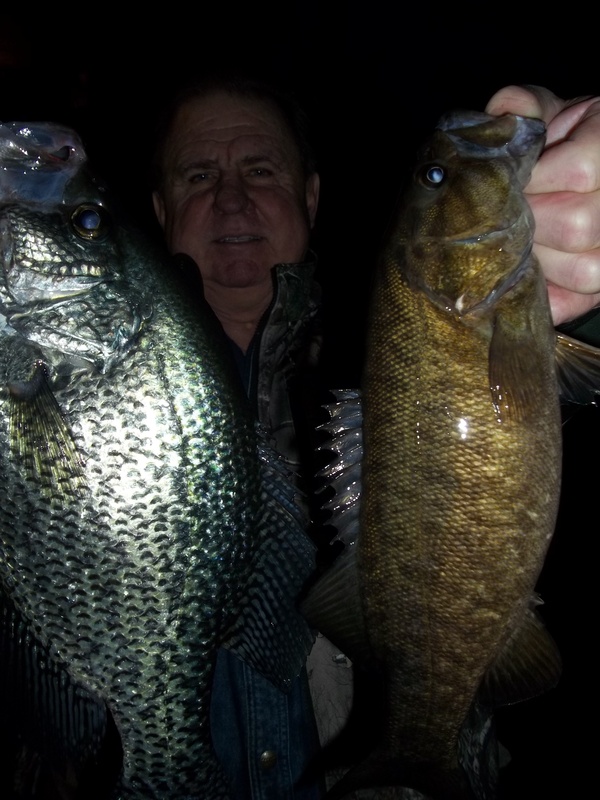 The best bite for them is evening just before dark on shadowy banks near brush on the 5-inch plastics. 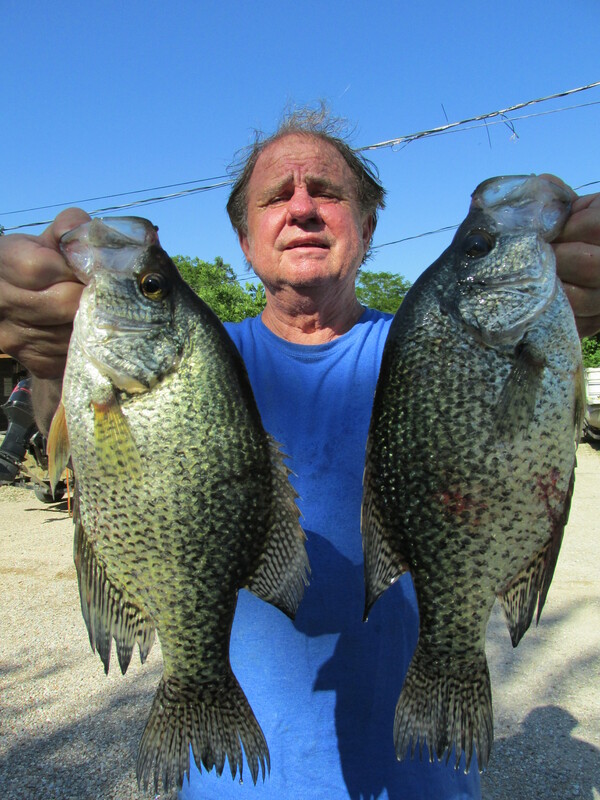 Some crappie have spawned and moved to brush but some are also still in the creeks on any wood. Bluegill fishing should get very good soon. Blackburns still has 1-bedroom cabins for $53/day for two people with a free boat stall with your cabin and free 24-volt trolling motors for your fishing pontoons which we have several for rent. Check prices before you book and save a lot of $ here at Blackburns where we do not charge you too much. Tom Kelly with some good ones. Iowa Boys can catch fish too. Gus Carlson With Some Good ones. A lot has changed. First the thermocline is gone. It was at 38 feet for a long time and the oxygen level was poor at below 32-feet but not now. A lot of fish that were staying in 30-feet of water are schooled, roaming and scattered. Big fish are anywhere from shallow to 48-feet. 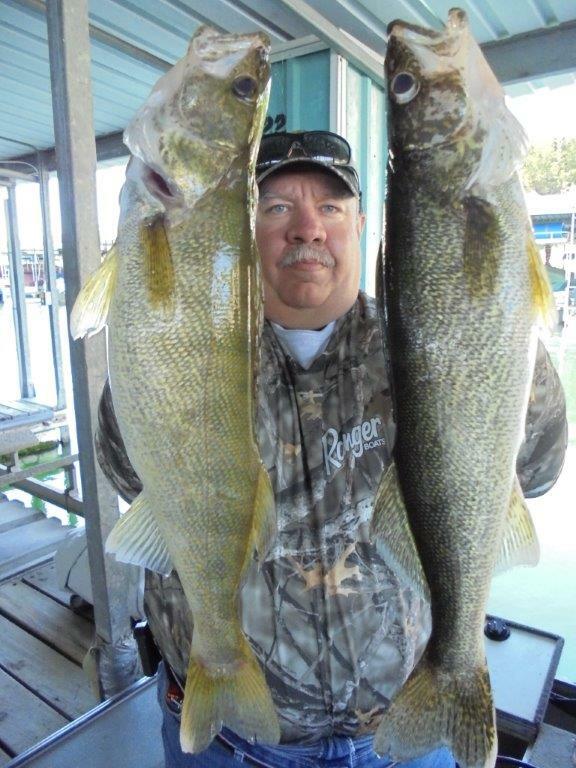 Deep brush in 40-feet or more are holding big walleye and black bass. 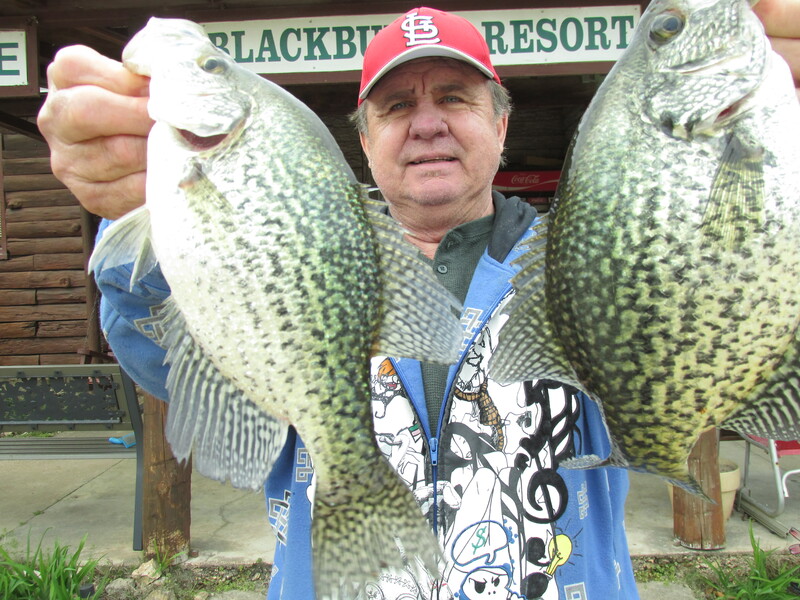 Many crappie have moved in from open water and are schooled on brush at 30-feet. The surface temperature is 75 degrees and the visibility is pretty good on main lake and clearing in the creeks. Some open water fish are showing up suspended a bit in 60-feet of water. 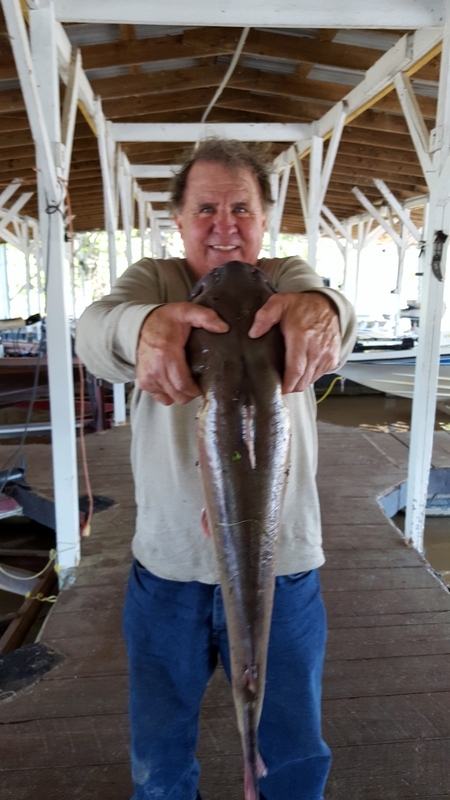 Catfish are also on brush at varied depths. 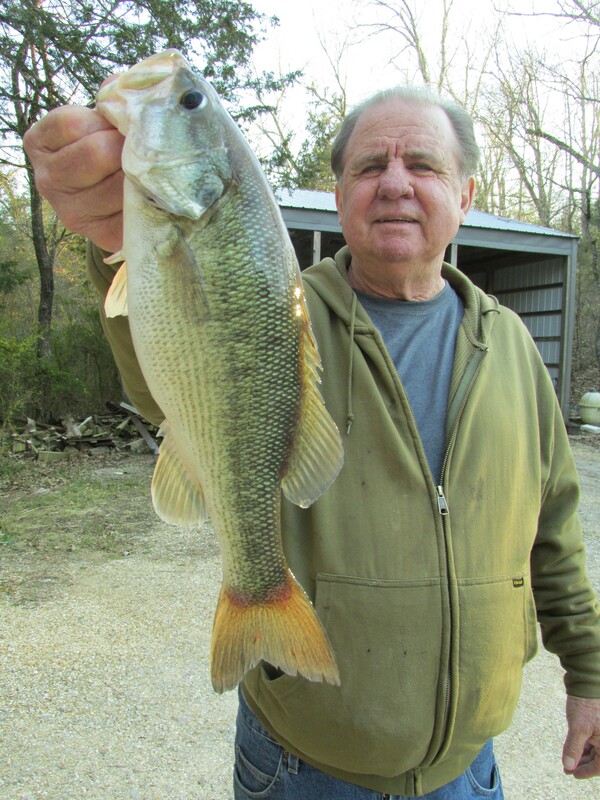 This is a good time to catch some good bass and many are holding crawdads. 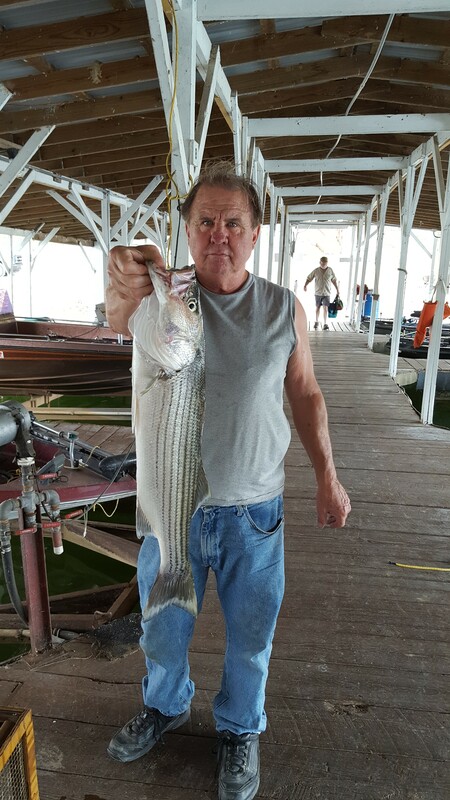 I got a nice striper on a main lake point in 30-feet of water on brush. The lake level is 553.25 and dropping slowly with one generator partially running for several times a day. 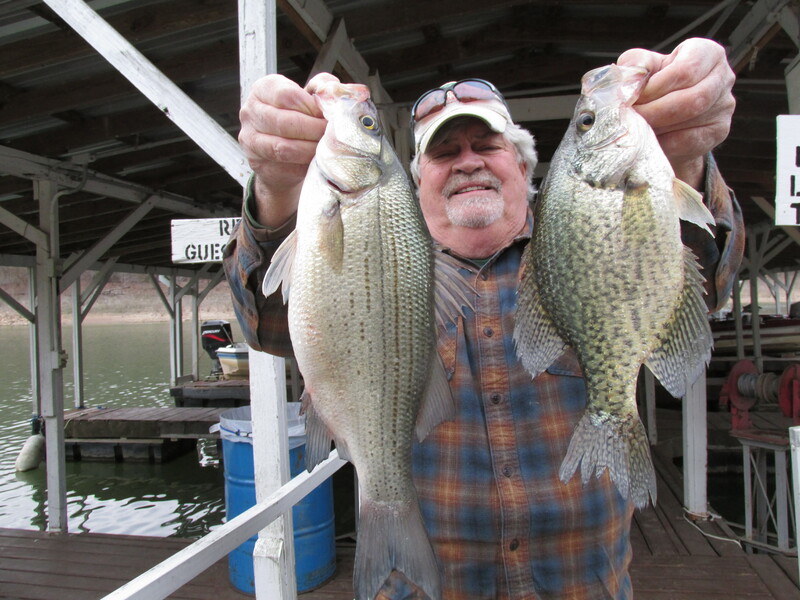 Many bait fish, mostly bass and bluegill have moved to cover at all depths. This is a good time of year to catch about anything and will continually get better for several weeks. 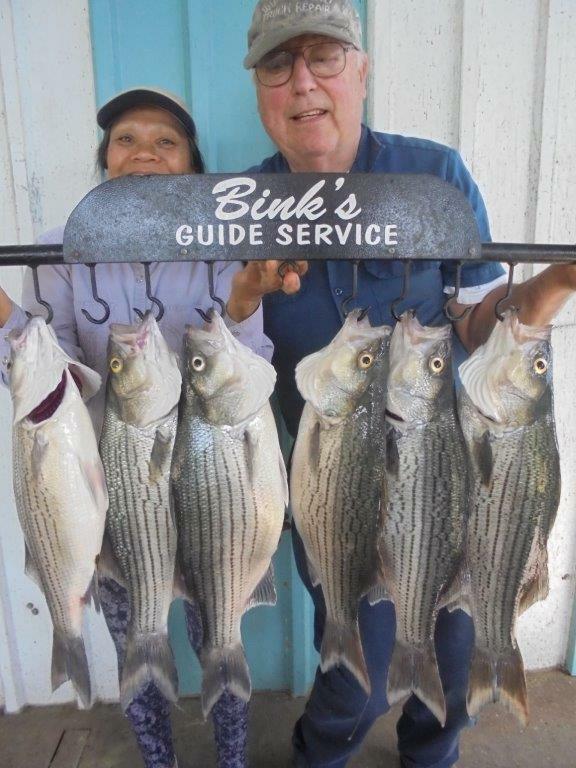 People are getting stripers up-river near the border on shad and hybrids and white bass are moving into Blackburns Creeks area on spoons. I like this time of year for both pole fishing and diving. 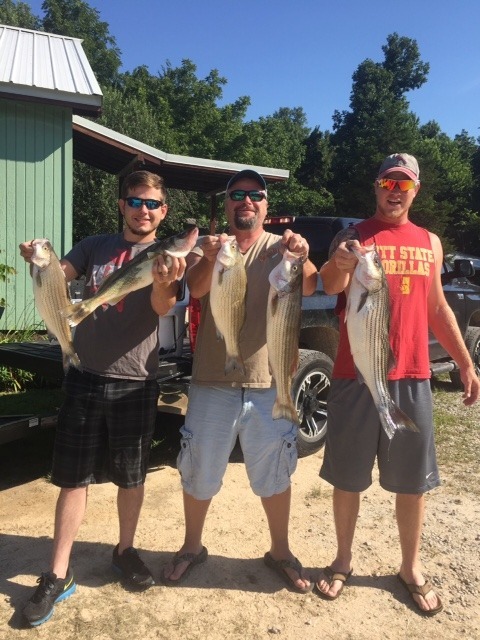 Good weather, good fishing and low prices. $53/day for a one bedroom. Why pay more? Most boat stalls free. 1-800-635-0526. Fall foliage peak is coming the last of the month and we received 1-1/2 inches of rain this week to help everything out. We were dry. Peep leaves, fish and dive all in the same day. The recent heavy rains have really muddied up the creeks and filled them up with debris from Cranfield to past the Robinson Point areas. The debris is moving with the wind. The middle of August also brings early morning fog so this combination is bad for props so watch out. The lake is very stable at 553.12 and they are running one generator just enough to keep it that way. The rain has muddied up the water on main lake points as well as the creeks and the visibility, which was good to 25 feet is gone. Bink reports that the rain had little effect except the level rose a few inches in the dam area. It is still clear and there is no debris. What a difference a few miles can make. He is catching walleye at the mouths and part way back in the creeks in 32-34 feet of water on the spoon. He is concerned about the stripers. They are schooled in 150 feet of water 35-40 feet down in the middle of the lake and there is no oxygen deeper than 45 feet. They want to go deeper but cannot. He says if it does not cool down there could be another fish kill. It is susposed to cool this weekend. 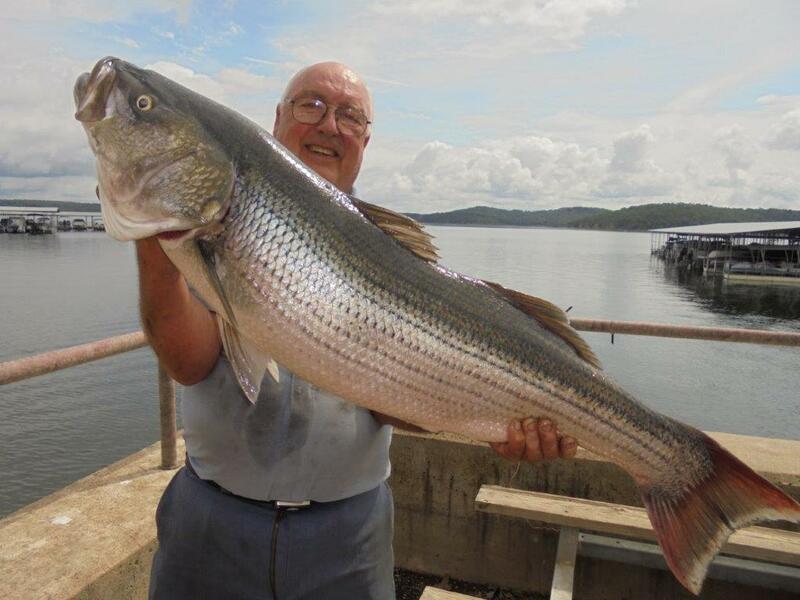 I hope so we do not want to lose our big striper. People are catching them by trolling umbrellas. Smallmouth and Kentucky bass are off steep banks on the ledge at 25-28 feet and are schooled. Catfish are with the walleye near the bottom. 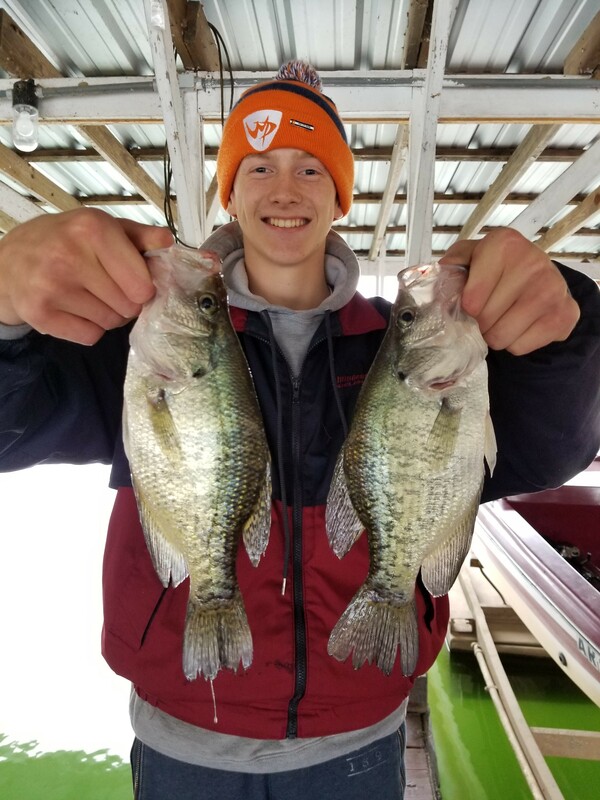 Bluegill are on brush and crappie are scarce. The lake It is at a good level. The surface temperature is 89. Different tactics for different parts of the lake. The lake level is very stable now with one generator running just enough to keep it at just below 553. The thermocline has dropped to about 27 feet with pretty clear water to there and a mud line from there to about 31feet. 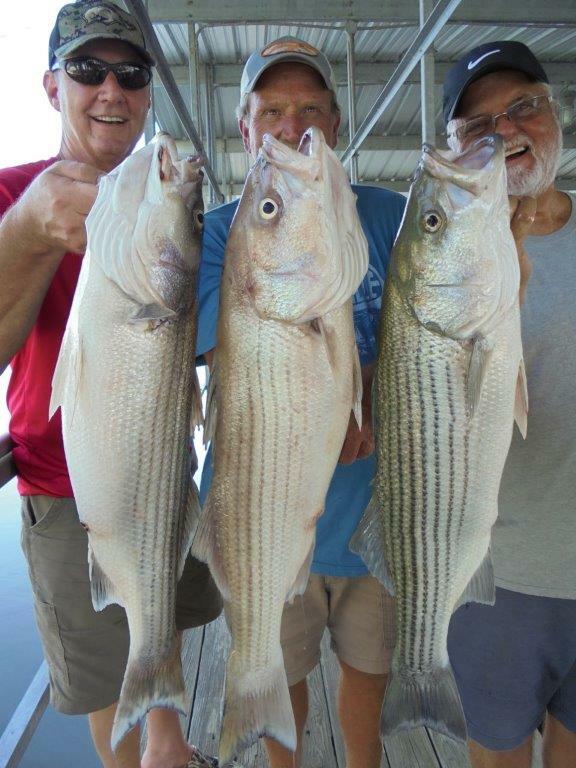 Striper are scattered and roaming and feed early and then move to deeper water. I am not seeing very many brought in but some. 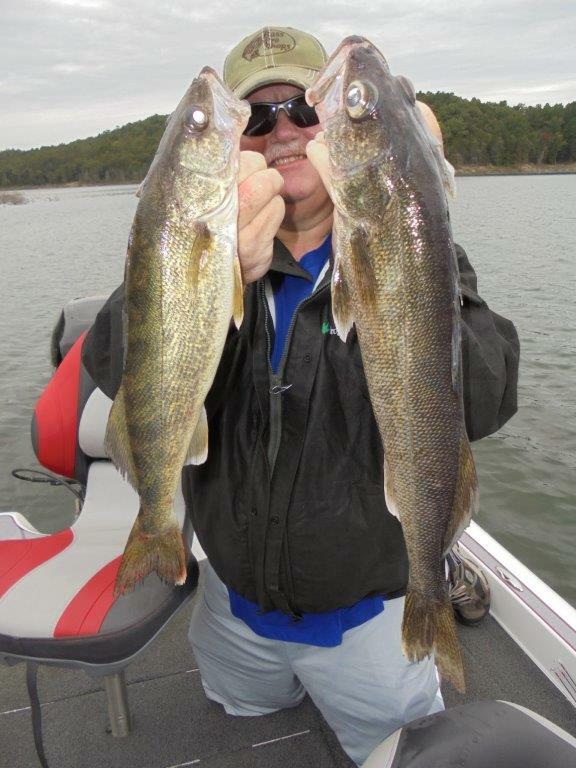 Walleye is the best bite and they are in 32-35 feer of water near the bottom on the end of main lake points. 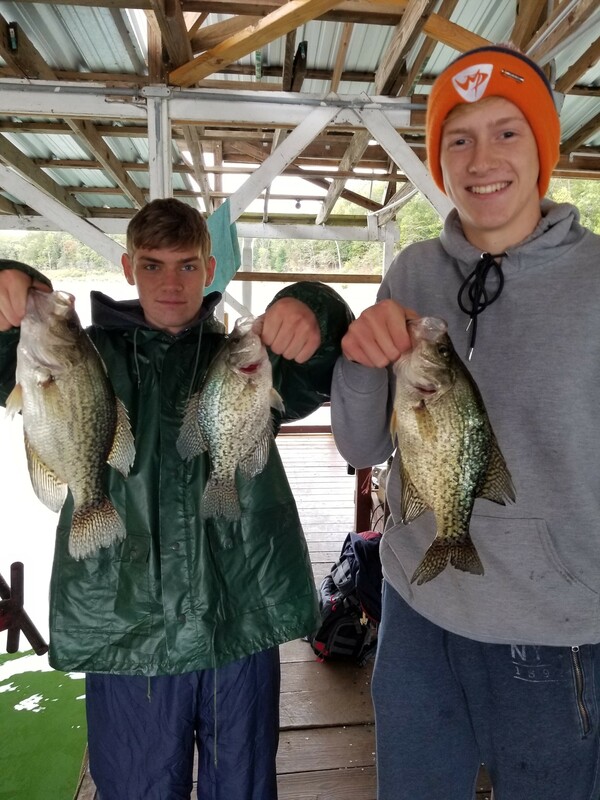 Some big crappie are with them on brush but the schools have not moved in yet. There are not very many fish on the brush but several fish above it in warm water especially smallmouth bass but they are mostly small. There are some big bluegill on the brush. Spooning is the best but good fishermen trolling deep diving crankbaits in 30-35 feet of water across points are catching good fish of about all species. I am surprised at the low number of fish on brush that is not on main lake points. 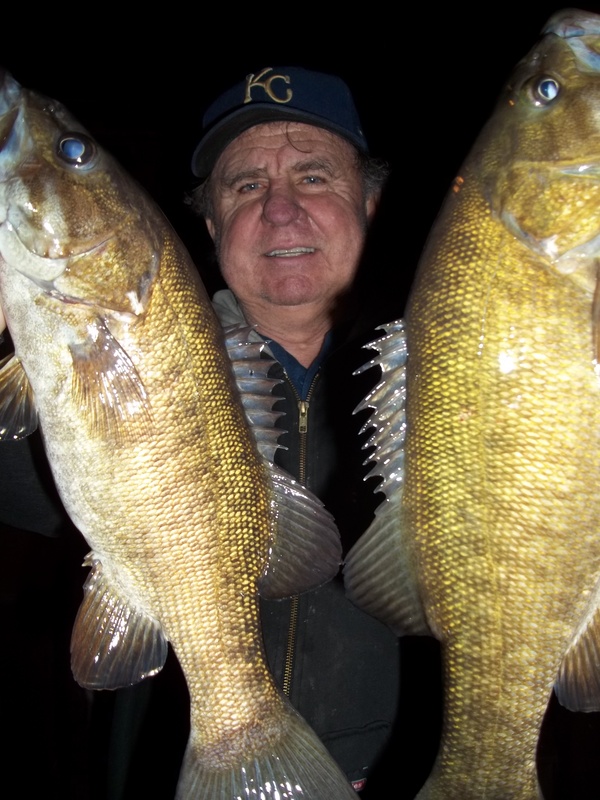 Night fishermen are catching some good bass on blacklights. It has been and is susposed to remain very hot for several days and the middle of the day fishing is poor. Get out at first light, fish until about 10:AM, take the middle of the day off and go out again about 6PM. I like glow in the dark saltcraws for after dark bass fishing. Scuba diving is getting better as far as visibility is concerned but fish always get a little scarce this time of year until the crappie move in. They are getting several catfish but I do not hunt them very much preferring walleye and crappie. The lake is still rising slowly with little generation. It is now over 557. Both the main lake and creeks are stained. There is a thermocline at 20-feet with cold water under. 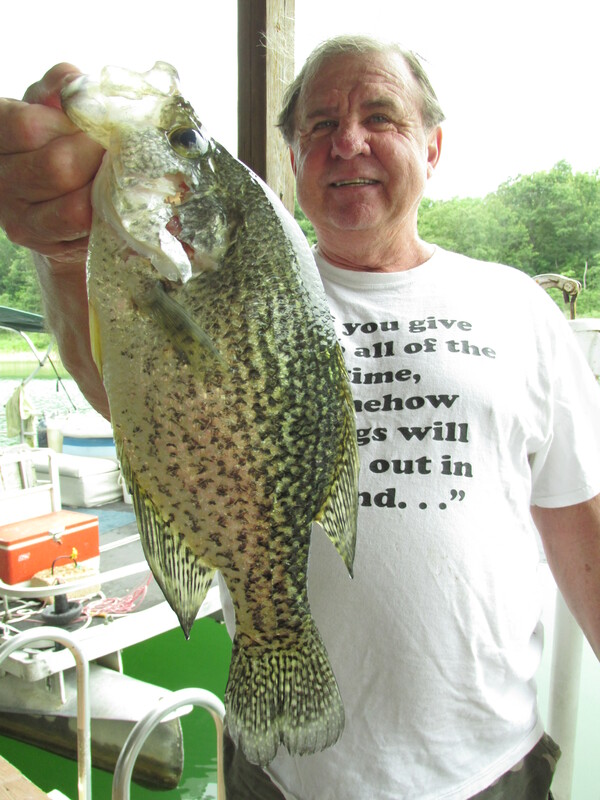 Crappie are fairly scarce but you can catch some if you know where. You have to cull several to get a keeper. 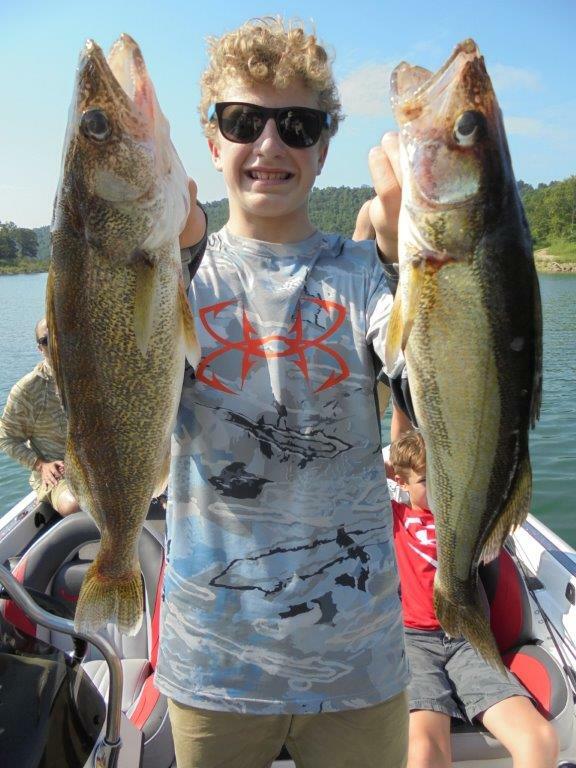 Walleye are on main lake points in 23-30 ft. of water near the bottom with smaller ones suspended in 50-ft. about 30-ft. down. Spoons and dragging night crawlers are the best. 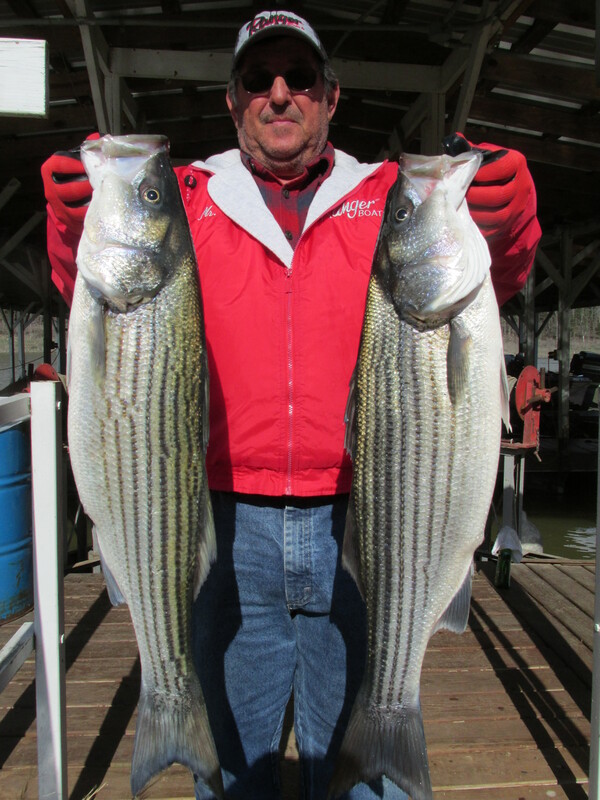 Striper have moved deeper and to the main lake and are also suspended in about 50-ft. of water. The surface temperature is 85 degrees and rising. Out normal ambient high is 85 and we have been in the 90's with lows near 70. Night fishing with blacklights and salt craws are producing some nice bass. The only top water left is bass and they are mostly small. 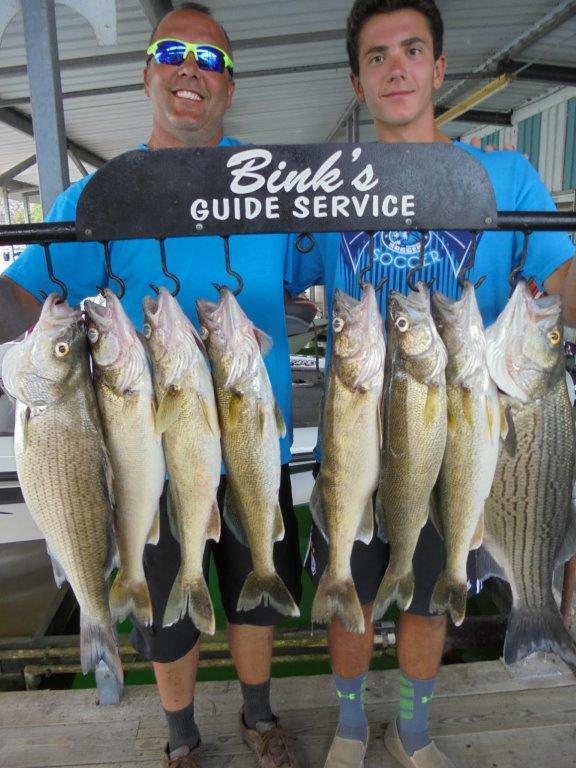 I got some nice walleye and white bass diving yesterday and the big ones were all below the thermocline. 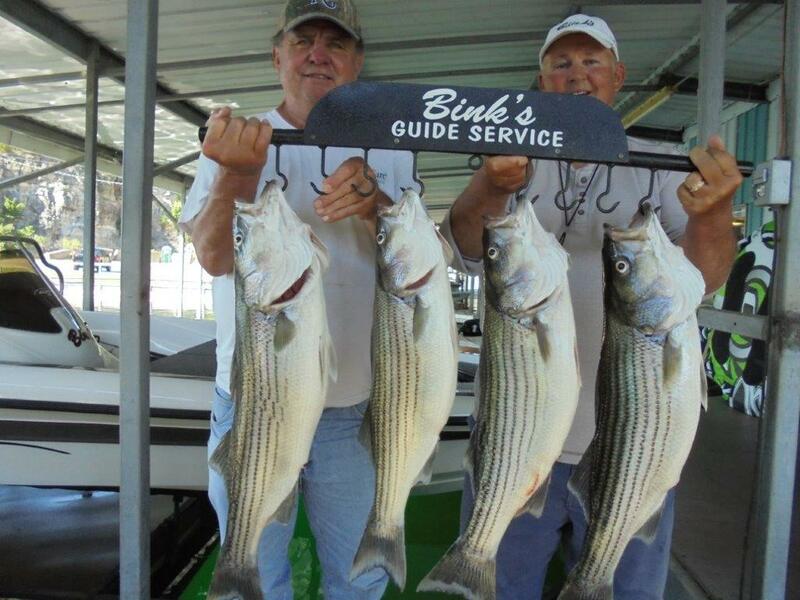 Bink is on the big striper and catching them everyday but they have moved from the creeks. Blackburns resort and Boat Rental has some openings for this week and would appreciate your business. Call 1-800-635-0526 if you do not want to pay too much. We have mostly free boat stalls and do not charge for trolling motors on pontoons. This is the biggest fish I have seen all year. Rum Binkley. The lake level is stable at 553.8 with one generator running continuously. The surface temperature is 74 and is not changing much. The main lake is cloudy and the creeks are stained. There is no thermocline yet and there is no reason for the fish to be at any particular depth. The visibility is about 4-feet down to near 30 feet. 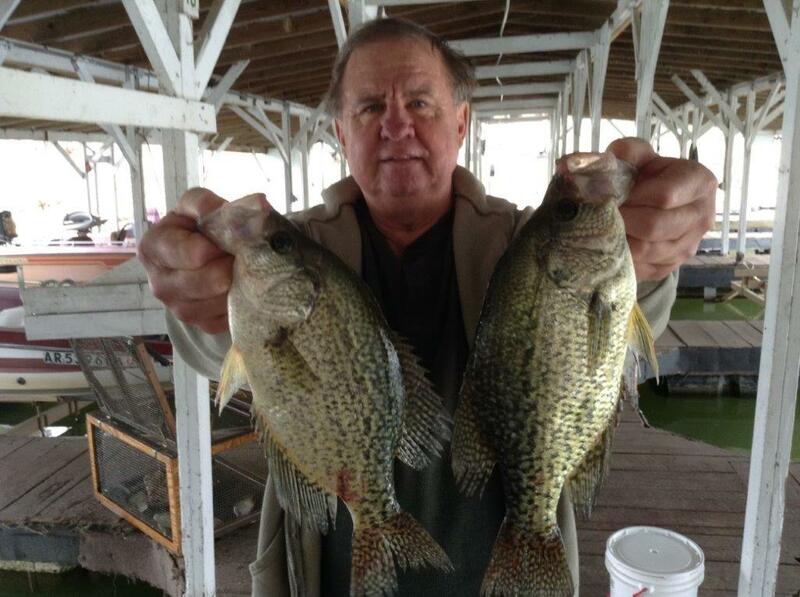 Fish are coming up both mornings about 6:AM and evenings at 6:pm and other times in between on cloudy days. Spooning is best when the fish go down. I am catching walleye on brush at about 20-feet on main lake points and some big bluegill but few large crappie. Several smaller ones are being caught in Pigeon and Redbank. 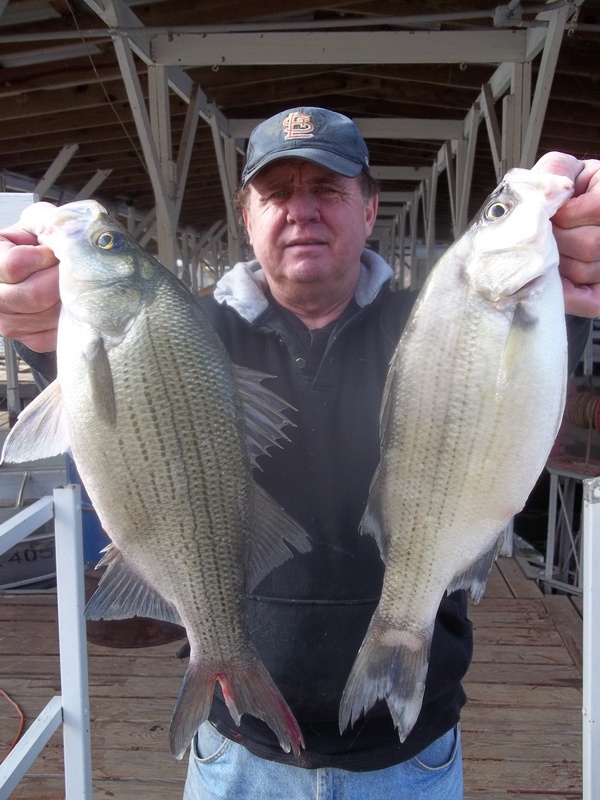 Black bass are both on the brush and in open water on shad. Small bluegill and warmouth are holding the big fish on the brush. Shad are everywhere and can come up anytime. Look first on banks where the wind is blowing into. Learning to catch fish after they go down is the secret. Otherwise it makes for a short day of catching. 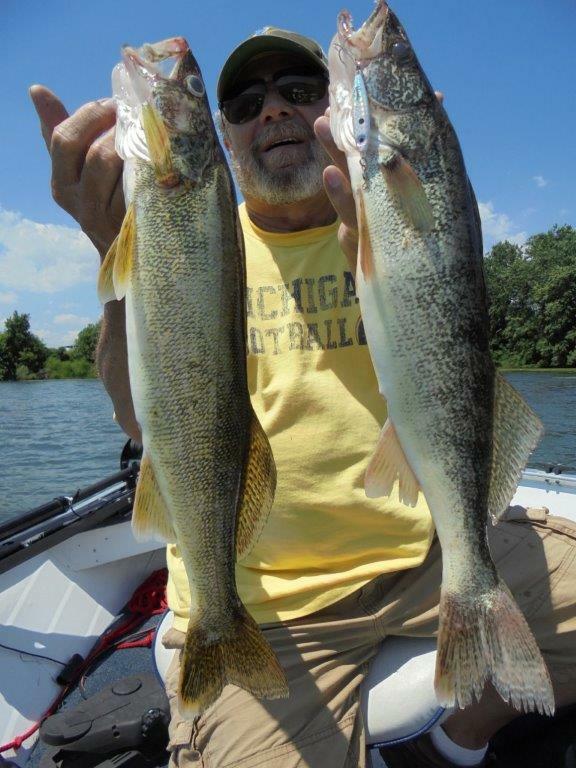 I had a report of walleye being in 10-feet of water on points but have not personally found these. Fish are coming up around Cranfield Island and Point 5. When the thermocline finally forms the fish will be right above it or just below it. There will be a lot of fish at about 16-20 feet soon. Well the water has warmed up, the spawn is almost over and the spring top-water action has begun. 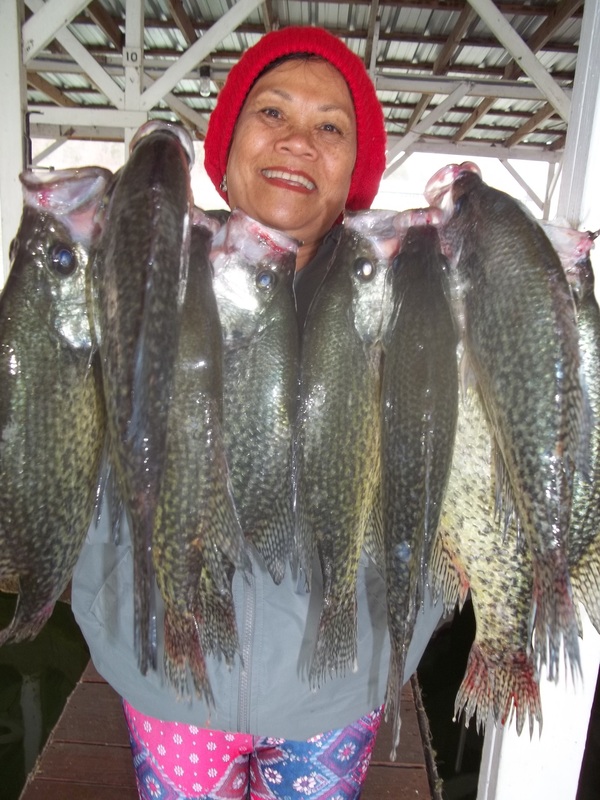 Many fish have left their beds, crappie are moving to the brush piles and walleye are starting to go to mainlake points. 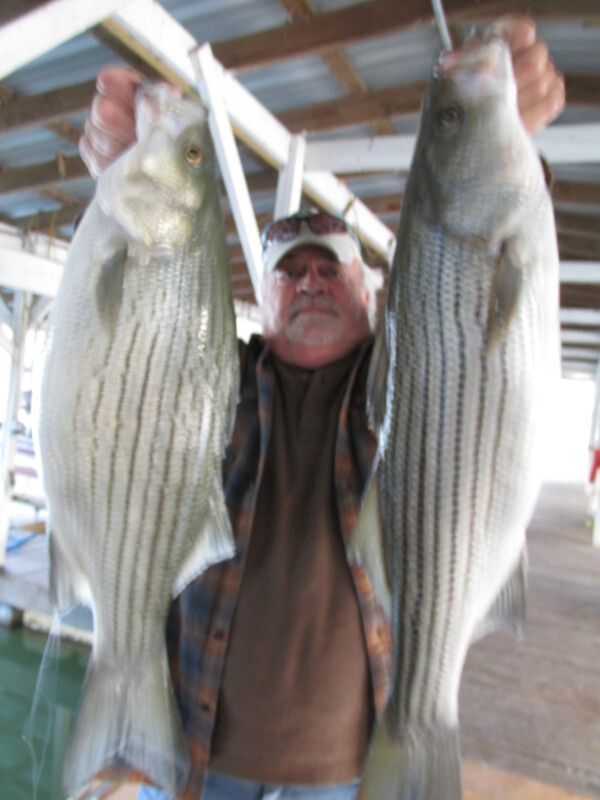 Stripers, Hybrids, White Bass and Bass are coming up almost every morning and some evenings. This is the time to get your zara spooks for stripers and spitin image for bass and be out there before sunrise and again in the evening and walk that dog. Take the middle of the day off unless it is cloudy then fish a creature bait like a 3-inch plastic crawdad with a 3/16th jig head in the creeks. This has been slow coming but is finally here. Come on down. 1-800-635-0526. The lake level is 559+ and the surface temperature was 58.4 last evening. They need to do more to drop the lake. It is much too high for December. 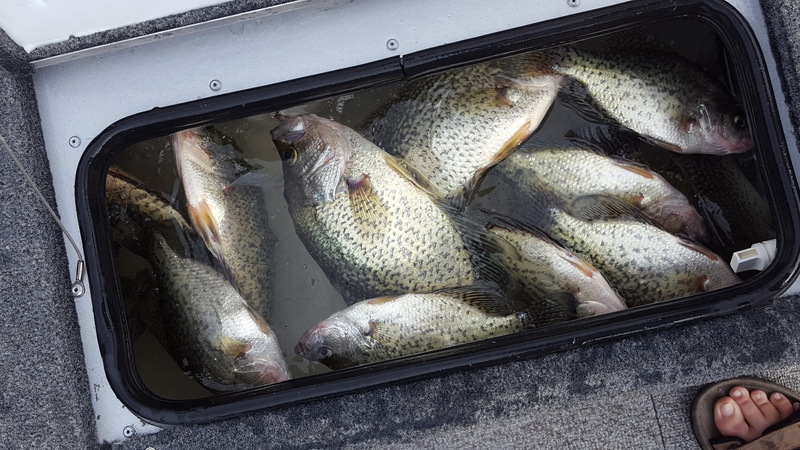 There has not been a fall bite where the open water fish move to the bank to feed after dark but they are still on the long flats suspended in 30-60 feet of water but feeding more heavily. The high water has allowed the shad to spawn several times this year and their population is back up. The fish do not have to move to the bank at night to feed but just stay on the shad and feed all the time. 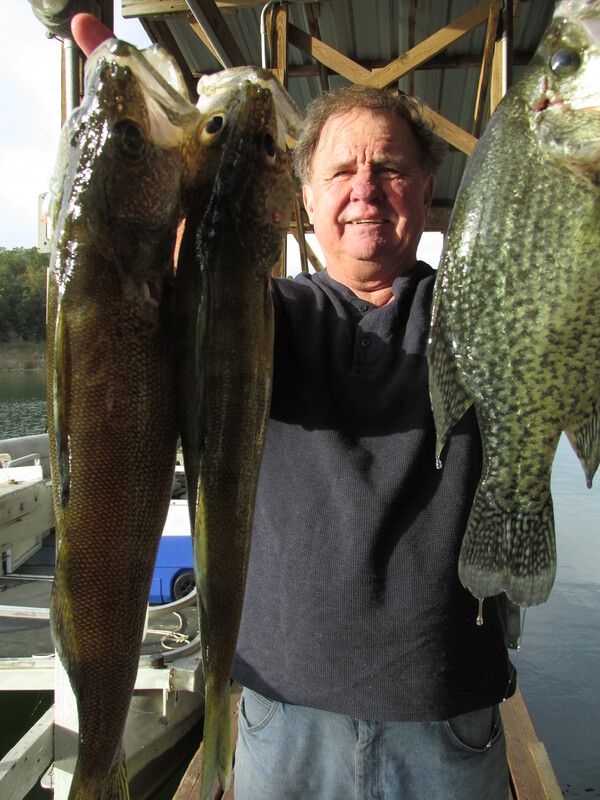 If you have a good locator and know where to start you can catch fish. They will feed heavily until the water temperature drops and they become more lethargic and move to the old river channel by the bridges and Bidwell where they will be more difficult to catch. Find the shad, note their depth, drop your spoon to the botton and reel it up two feet per turn for a baitcaster and one foot per turn for a spinning reel and snap your line up about six feet and allow to drop on slack line into the shad. Some times it is good to drop the spoon to the bottom and reel up fast through the shad. Bink and I usually catch the biggest fish of the year during the full moon in November on a stick bait but not this year. I am spooning brush in 28-32 feet of water and catching some good smallmouth, largemouth and crappie . That is what I am after. There have not been many changes except the open water fish on the flats that have been there for several weeks are feeding more heavily and the water is still rising. Walleye are getting a little more difficult to catch. 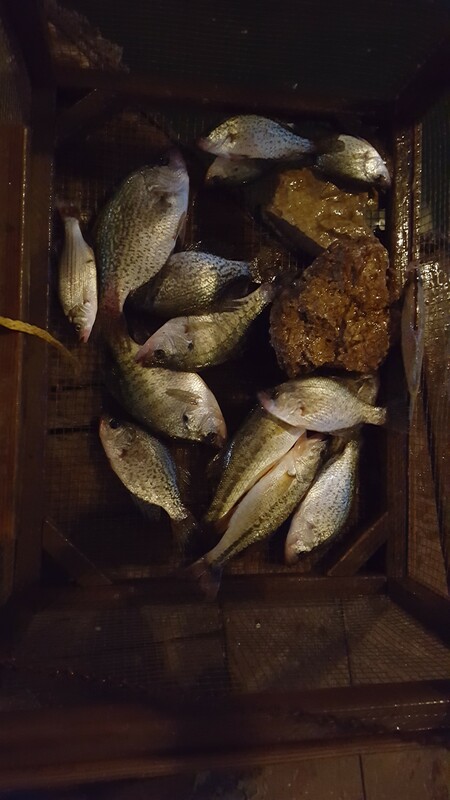 Several crappie are being caught off the dock but only about 11 inches. The big ones are near the bank at dark on a grub but not very many. 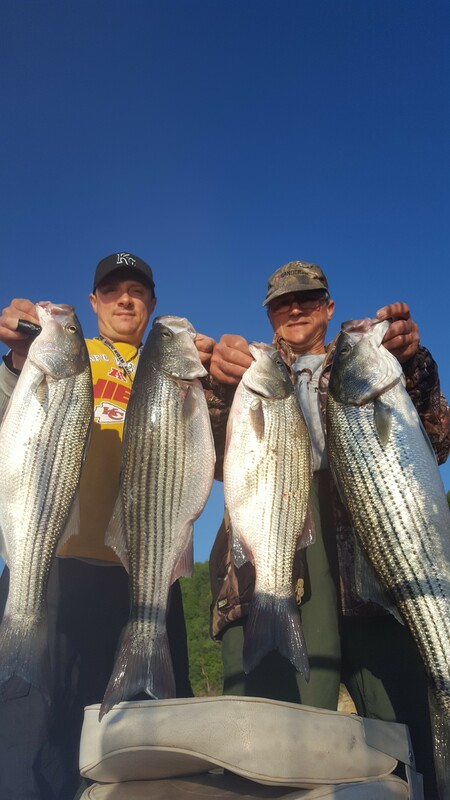 Not many big stripers are being brought in only in the 5-8 pound range but a lot of white bass and some hybrids in the 3-5 pound range. The lake level is 556.44 and dropping 4-inches a day with heavy continuous generation. Wish they could have done this during the summer. All launch ramps, parking lots and roads are open again and in good shape again. The surface temperature is in the low 70's and the main lake is clear and the creeks are stained just right for fishing. The open water fish are following the shad which are following the plankton which follow the wind direction. One day the fish will be in the North Creeks and the wind shifts and they move to the south creeks. I like this level now and the brush which had been too deep is now in play. The most important tip now is to fish the stained water. I have been catching fish close to Blackburns in 30-feet of stained water with a 1/4 and 1/2 ounce Bink's Jigging spoon. I only use the heavier ones in deep water. Grub fishing was pretty good but has stopped now. 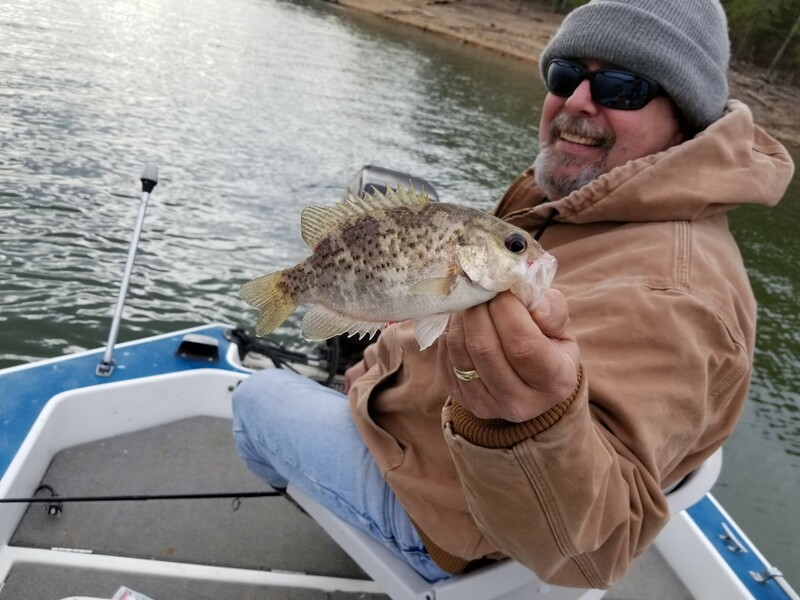 Crappie are starting to bite on brush with a slip float and minnow but are also moving with the wind and bass are still hitting a single spin and crank baits in the creeks. I am not much on crank baits but they are catching smaller fish now. I am only fishing brush piles now. The white bass are biting in the creeks but are small. The big ones with hybrids mixed in are not here yet. It is too early for a night bite but that is determined by the lake turnover. Norfork lake does not turn over violently with debris coming to the surface off the bottom like shallow northern lakes. The thermocline just inverts and the clarity, water temperature and oxygen level is the same for several feet down causing the fish to scatter. After the surface water cools down with the short days the open water fish will school and come to the banks to feed at night and move further out during the days. This usuall happens during November. The other fish will also move shallower to cover and stay there. Spoons will be the bait of choice for a while during the day and stick baits at night. Until then I switch to a grub when the sun goes down. I have no luck with spoons after dark. This is a fun time of year and the lake is in excellent condition. The lake level is 571.60 and dropping about one inch per day with just a few hours of generation. The surface temperature is in the high 80's and the visibility is about 7 or 8 feet off rocky banks. The thermocline starts at 23 feet with cold water at 30 feet. I am finding walleye at the end of mainlake points just at the drop offs at 35 feet. 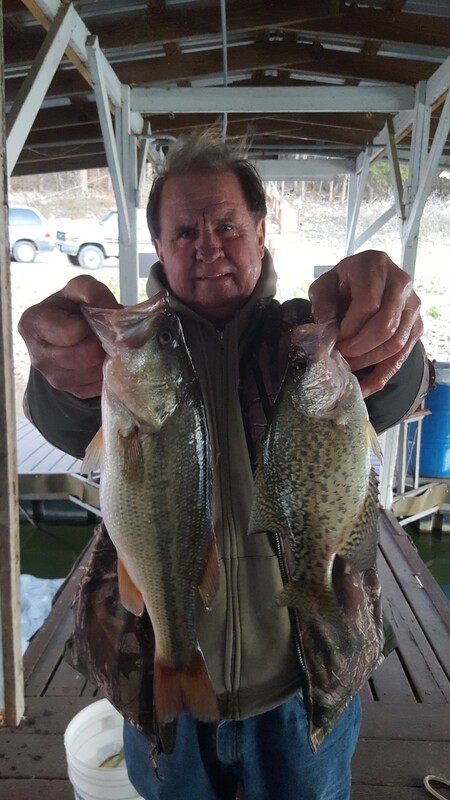 Some bass are with them and the crappie are starting to move in. 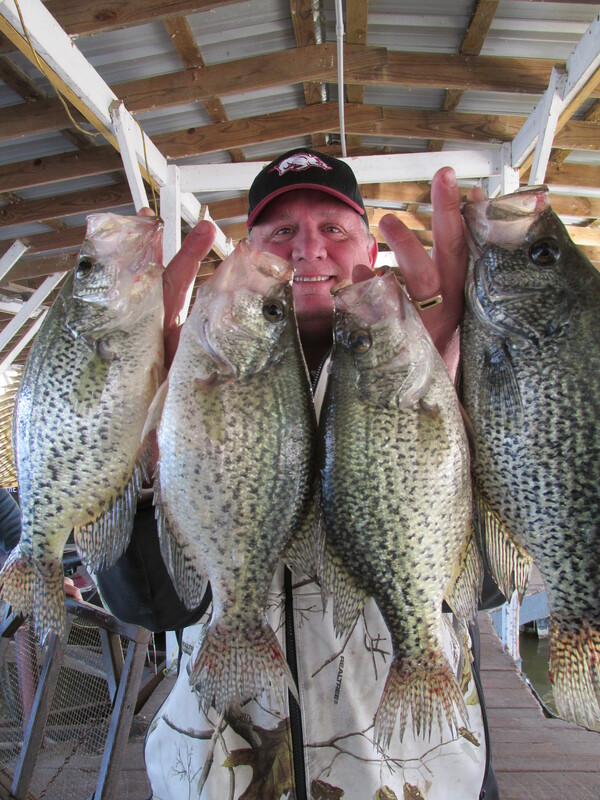 If you know where there is brush at less than 40-feet crappie will be there. 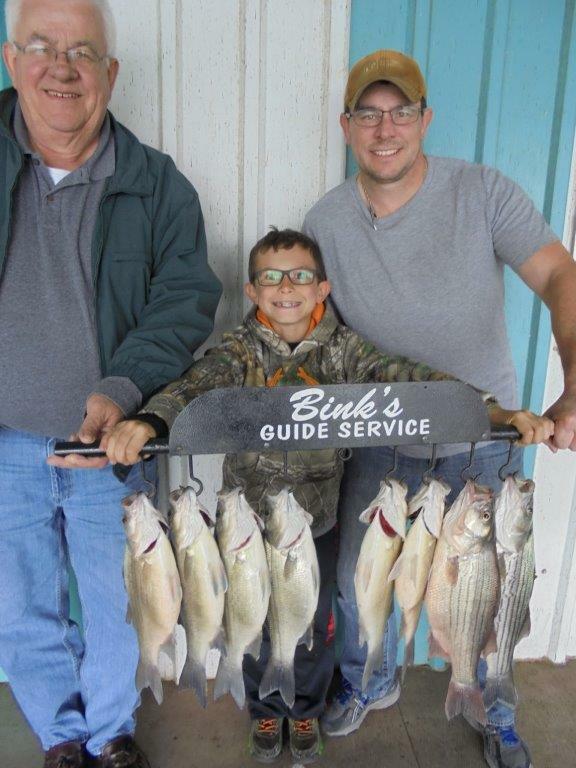 Billie Springer and his crew just left and did well on walleye, stripers and hybrids. They troll umbrellas and are good at it. Most people are using jigging spoons. Look for shad near old river channels part way back in the creeks. Bass are coming up most mornings early. Nothing has changed for several weeks.